Hi, welcome to my trip report. Last month, I went to Nashville over the weekend of November 16-18, accompanying my grandparents to a wedding. Our flight there was a nonstop on a 737-800, and other than it being a SkyTeam special livery aircraft and the flight being delayed an hour and a half due to ATC, it was uneventful, and we got into Nashville around 12:30 am on Saturday. We had a great time in Nashville, and had to leave the next morning, unfortunately much too soon. 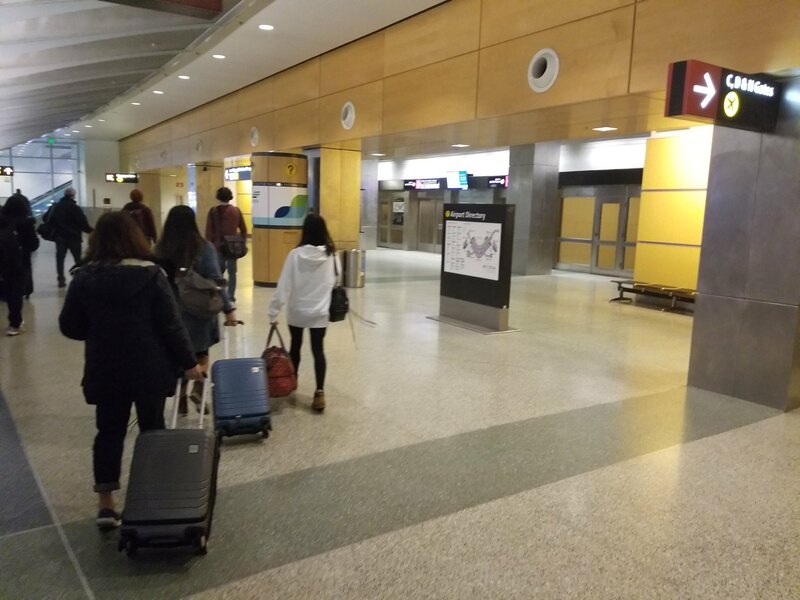 I woke up at 6 am for these flights, and after having breakfast at the hotel and packing, I arrived at the airport at about 7:55. It isn't that far from downtown, which was nice. 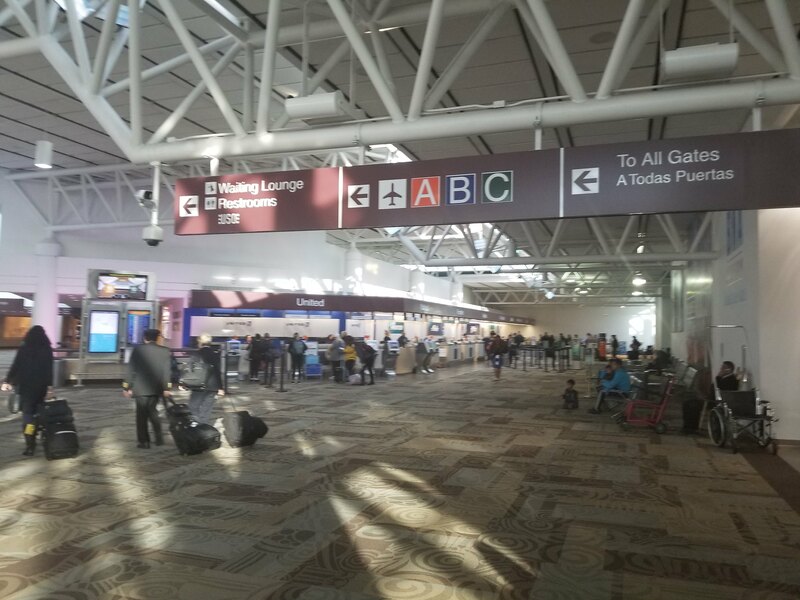 The airport wasn't crowded at this hour, so I was able to get my bags dropped and head to security without much of a wait. The line at security wasn't horrible either, and I was airside by 8:15, then I took my grandparents to the gate. Here was the podium for our flight. Since I still had almost an hour till boarding, I did some plane spotting. Delta MD-88, heading to Atlanta as well about an hour after our flight. 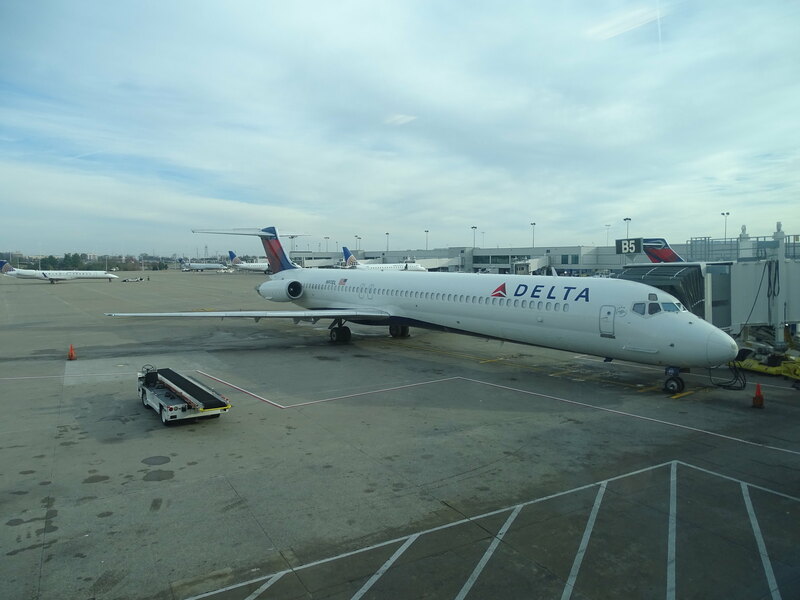 Delta 717-200, going to Detroit. 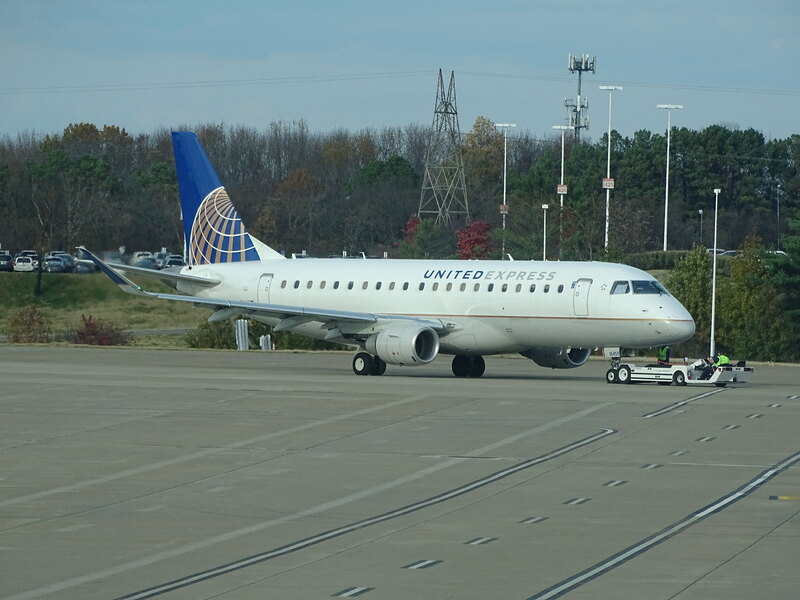 United Express E-145XR going to Newark. Personally, I think that route could sustain something bigger than a regional jet, but that's just my . 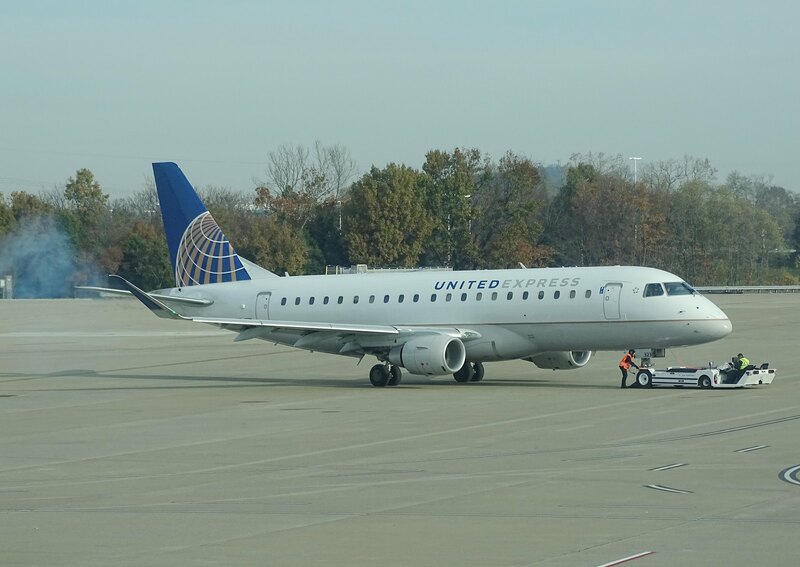 A smoky engine startup for this United jungle jet, bound for Washington-Dulles. 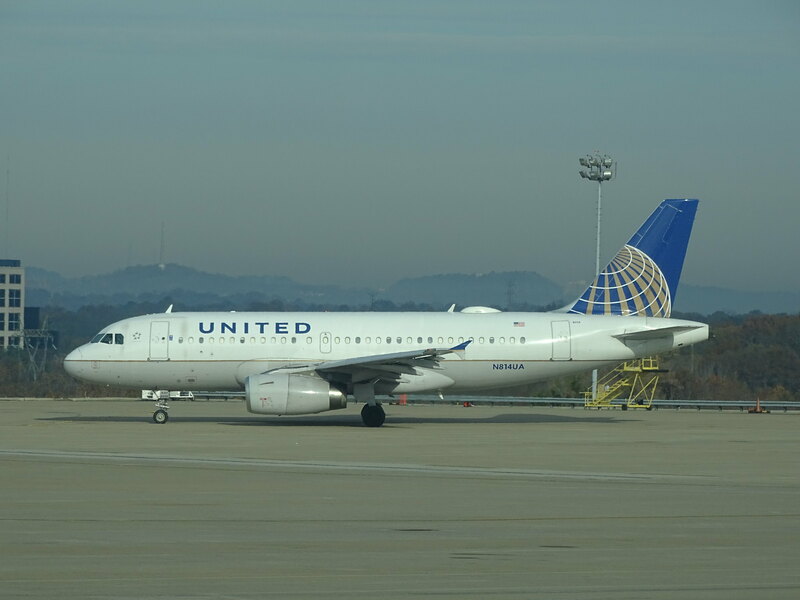 Another United jet, this time an A319 going to San Francisco. 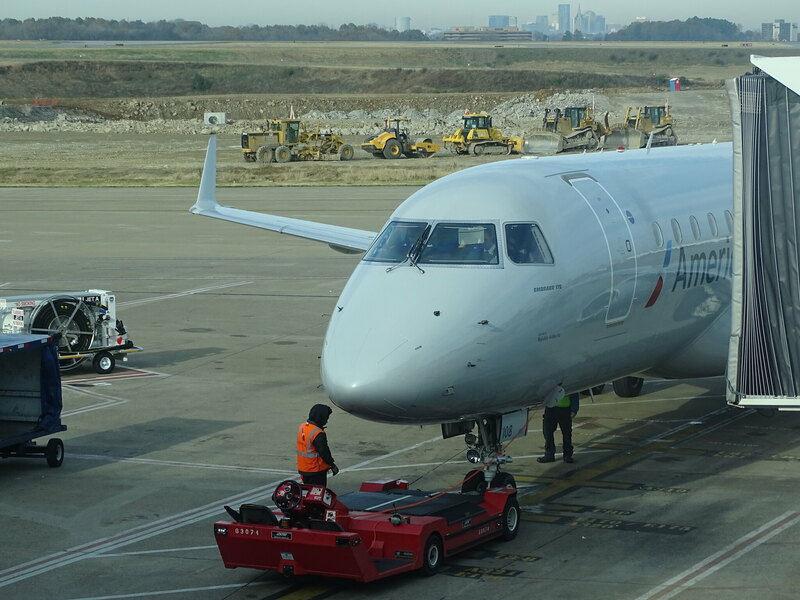 American Eagle CRJ-700 going to Chicago O'Hare. 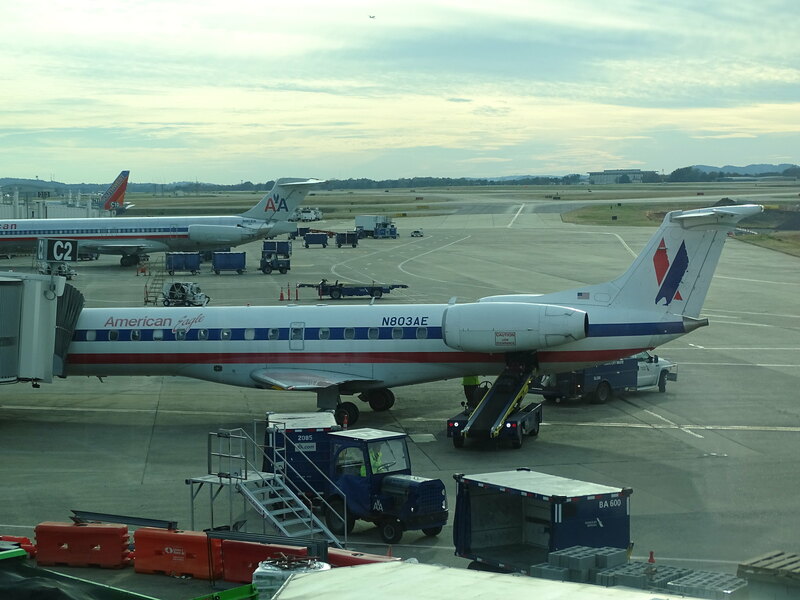 Another American Eagle plane, an E-175 going to Philadelphia. American Eagle E-140 flying to LaGuardia. 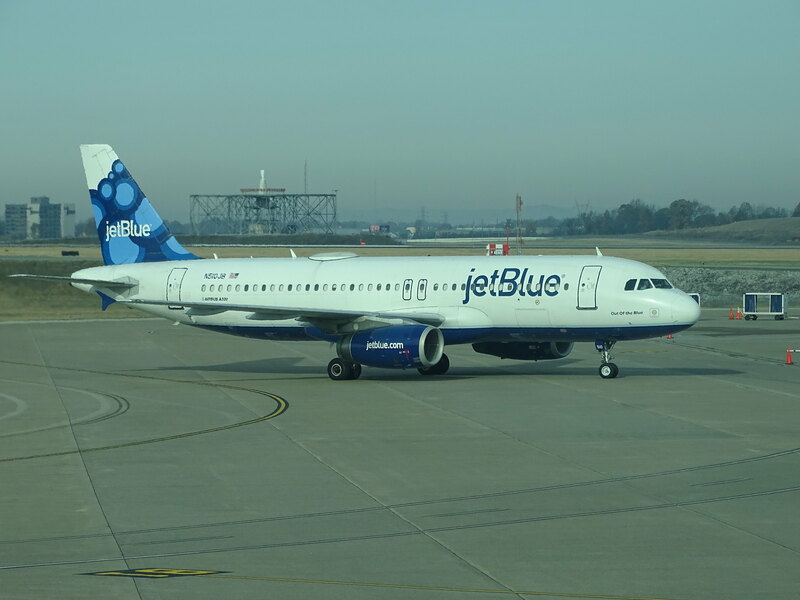 JetBlue A320 arriving from Boston, where it would also head back to an hour later. 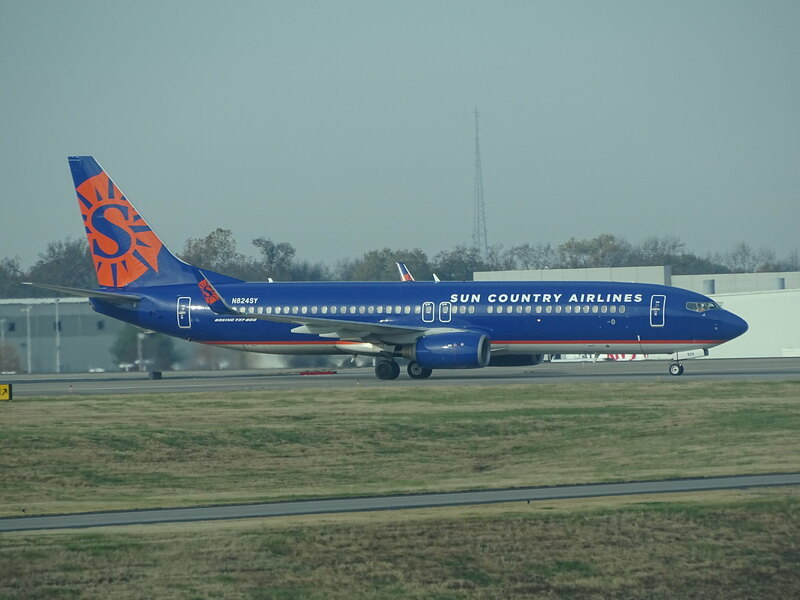 Sun Country 737-800 arriving from a positioning flight from Las Crusces, NM. It would fly to Orlando later that morning. 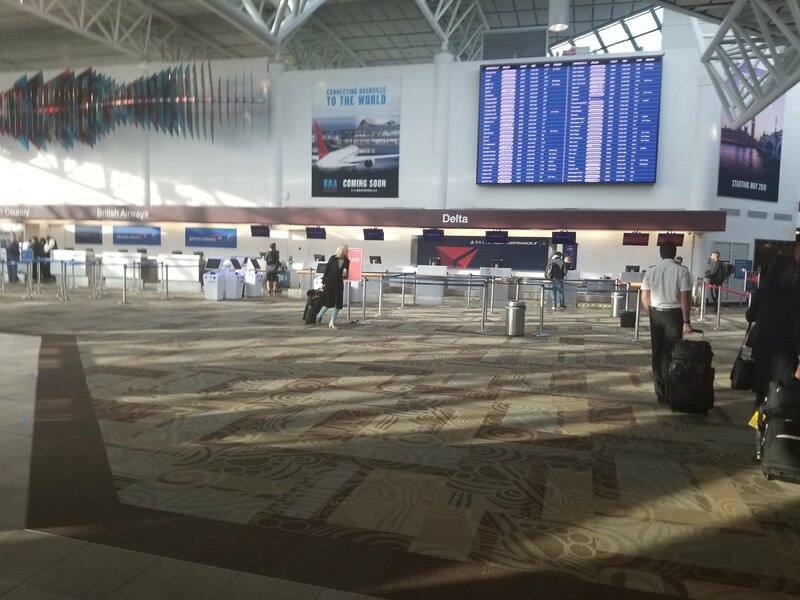 The terminals at Nashville are rather bland, but they had adequate seating, were all connected airside, and there was decent amenities. 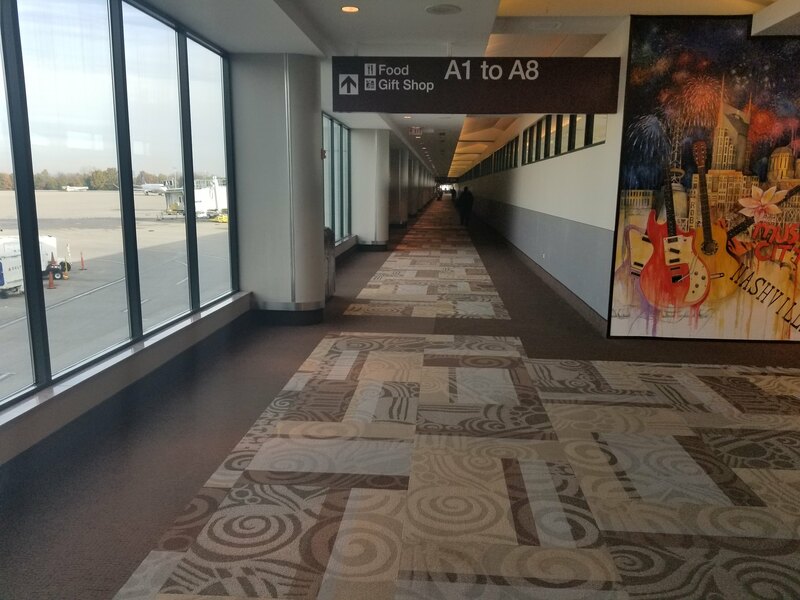 My only complaint is that the walkway to Concourse A is rather narrow and dark, but I hear they're renovating the airport so hopefully that'll be fixed. 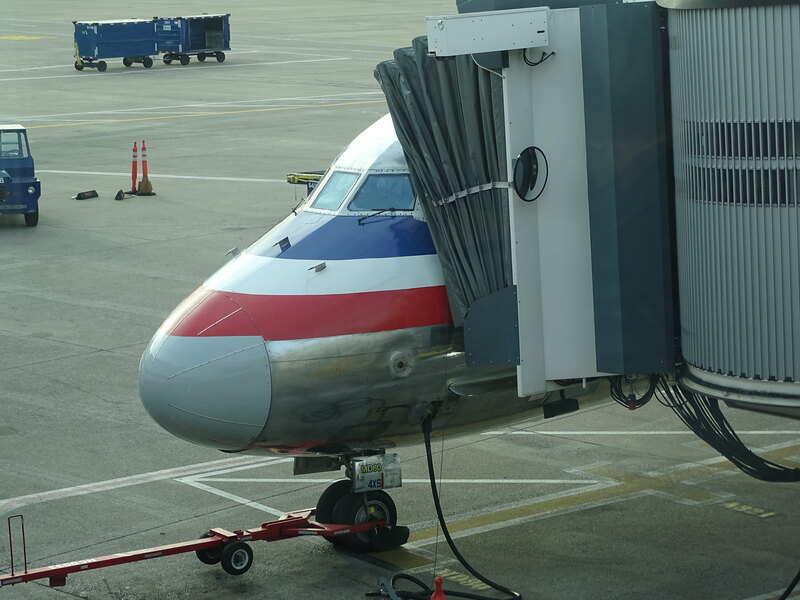 Before walking back to my gate in Concourse B, I got a photo of the plane taking me to Atlanta that morning. 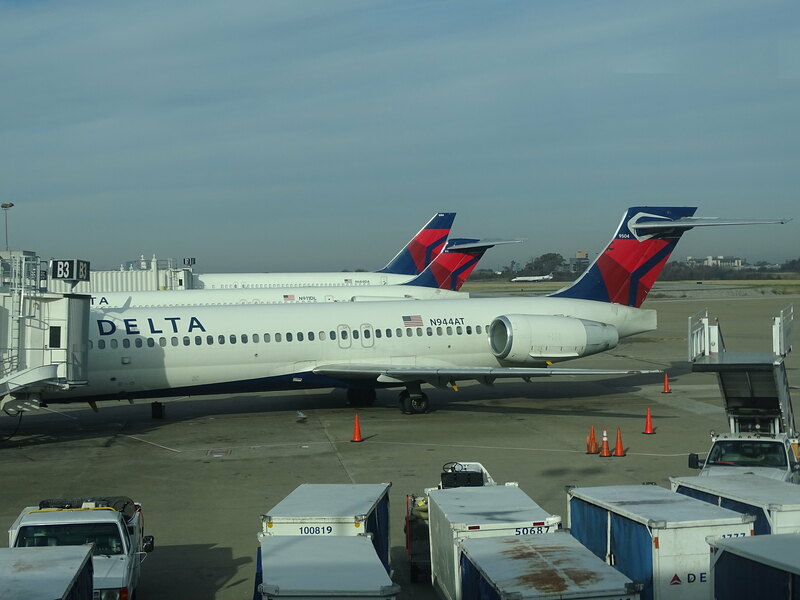 It was N684DA, a 25.7 year old 757-200 without winglets, that has spent its entire life with Delta, except for a short stint from 2003 to 2006 with Song. A crowded gate area since it was a completely full flight. 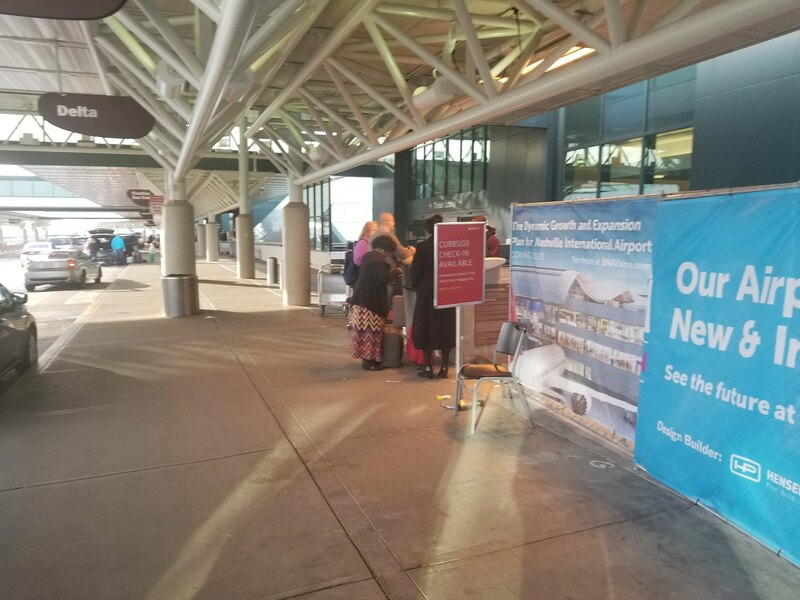 At 9:05 am, they started boarding, and a few minutes later my grandparents and I boarded in zone 1. A closer view of the flying pencil. Once I stepped onboard, I was very impressed. 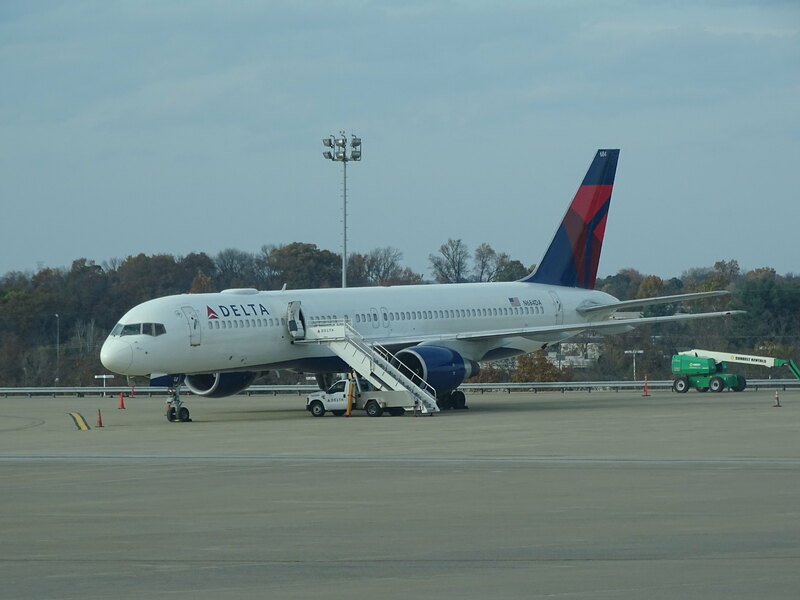 This was one of the 757s that Delta had done a cabin refresh on from nose to tail, and it showed. There were new, large overhead bins, new sidewalls and seats, and modern IFE. Essentially it was like an aftermarket Boeing Sky Interior, if that makes any sense. I was seated in row 31, over the wing. 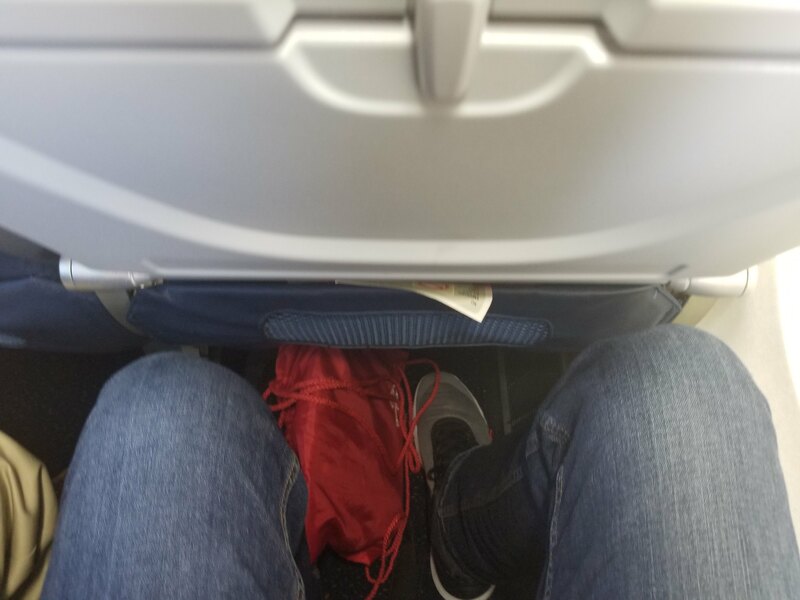 Legroom was adequate (For a frame of reference, I'm 6'4" or 1.93 m), and the seat was comfortable and had good recline. 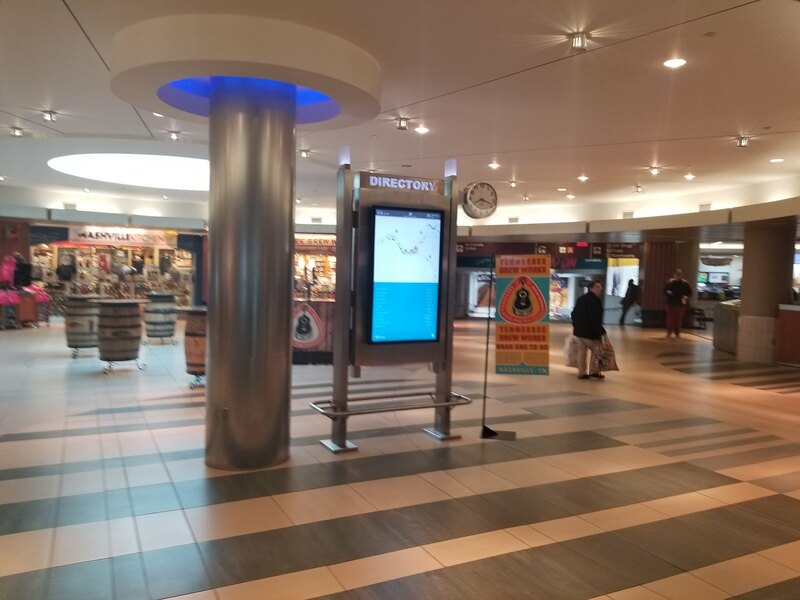 The IFE screen was modern, high-resolution, and had excellent touch sensitivity. 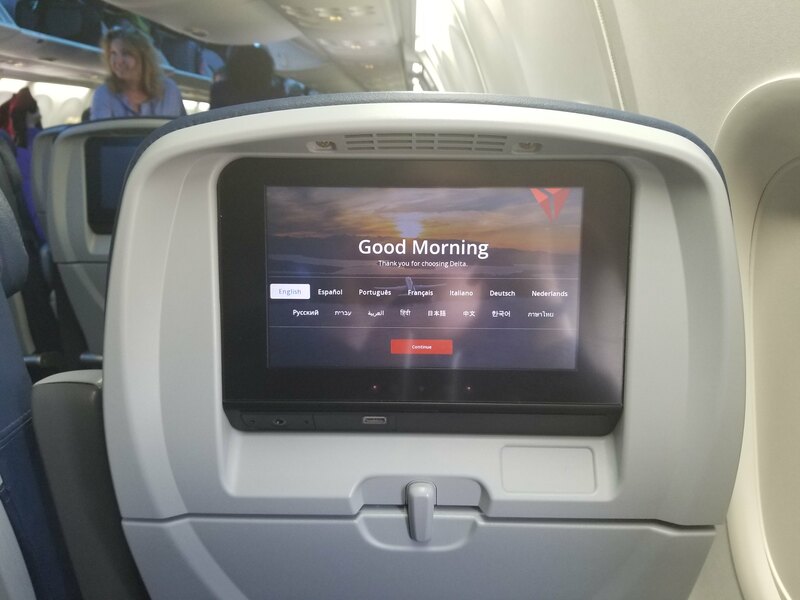 The content was the same as my inbound flight, so there was TV shows, movies, live TV, music, a flight map, and info about Delta. 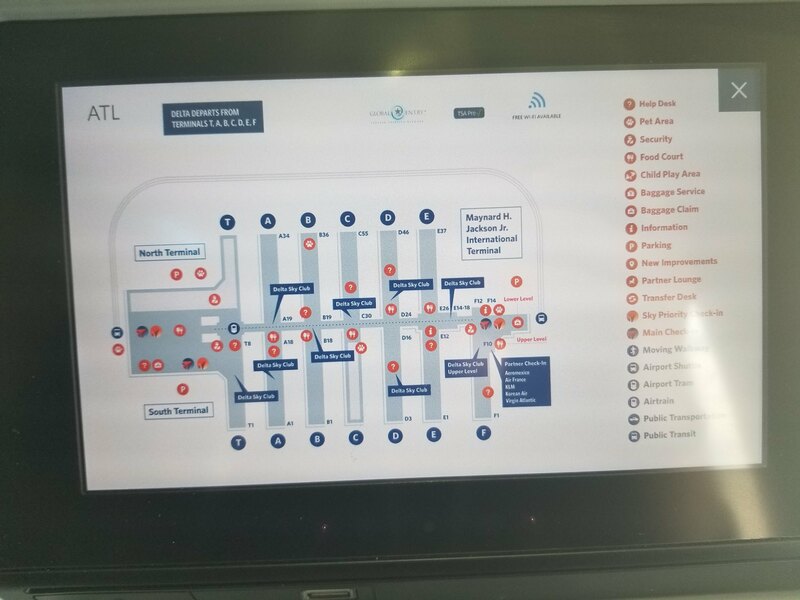 There was also airport maps, which I appreciated since it would have been my first time connecting through Atlanta. While boarding progressed, I turned the IFE to the flight data page, which I found pretty cool as an avgeek. 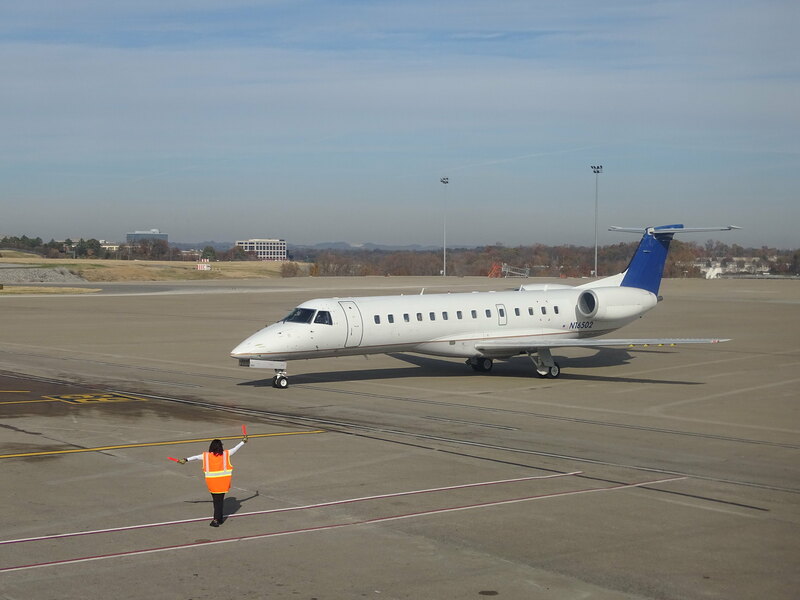 A Contour Airlines E-135 pulled up next to us, arriving from Tupelo, MS.
By 9:35 our aircraft was fully boarded and ready for departure. Right as we were scheduled to push back, the pilot came on the PA and said there was an issue with our emergency brake. They were calling maintenance, and didn't know how long it would be. While unsettling, I figured that I had a 2.5 hour connection, so I should be fine. 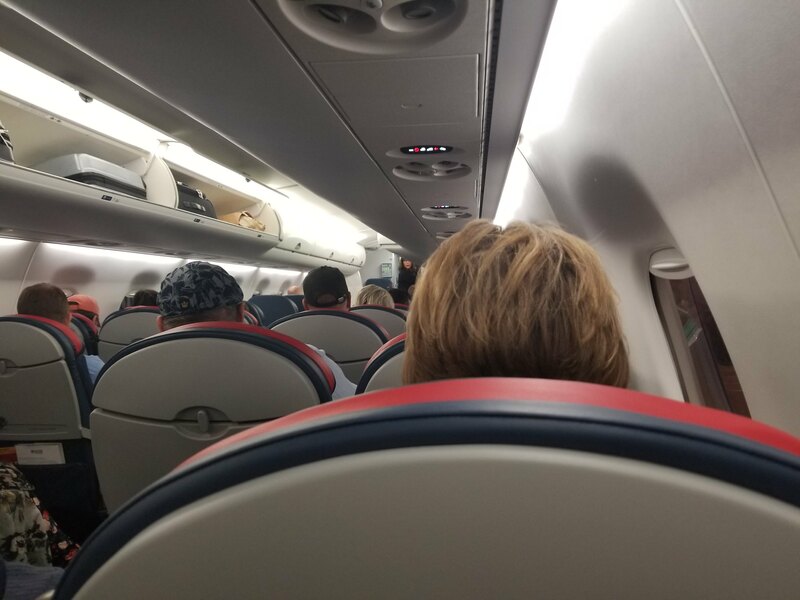 A customer service agent boarded the plane and was personally talking to passengers who had tight connections about rebooking, which was a nice touch. Our scheduled departure time came and went, initially being pushed back to 10 am. 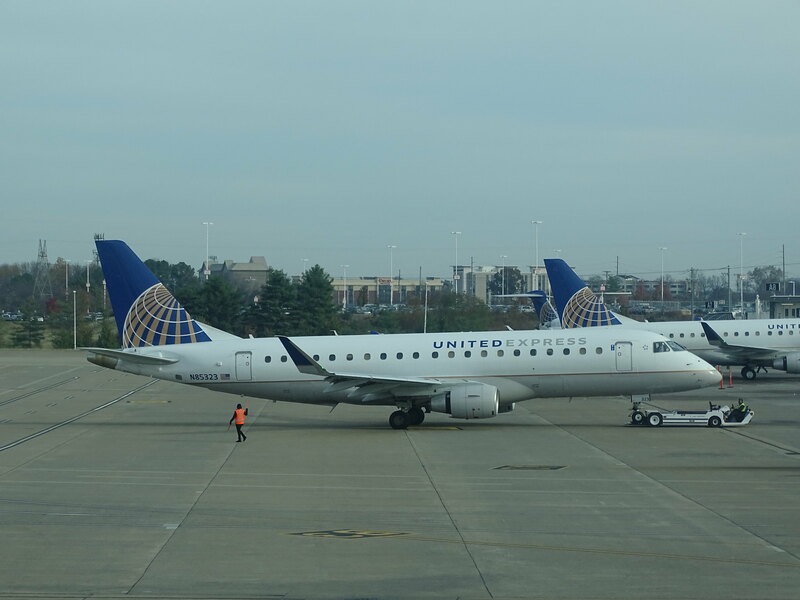 Meanwhile, the crew provided timely announcements, saying they didn't know an ETD, but that they'd be happy to assist with rebooking passengers and checking on connections. 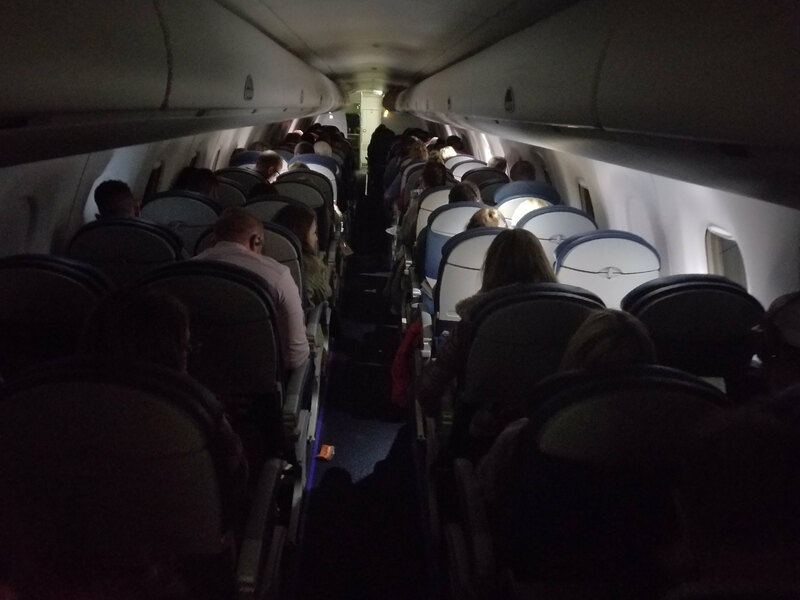 I'd estimate that about 30 or 40 passengers left the plane, and I stayed put. 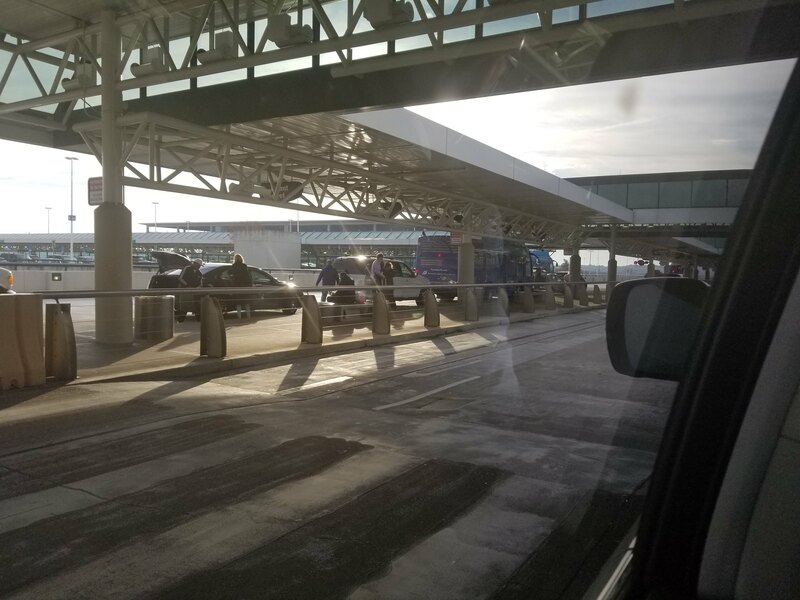 Finally, at 10:30 a mechanic entered the plane and came on the PA, saying that the issue was more serious than they had thought, and that the new ETD was 1:00 pm. He then proceeded to explain how to rebook, but warned us that it was a busy travel day and was close to Thanksgiving, so lots of flights were full. Even if the plane had left at 1 (which it didn't), I would have missed my connection by half an hour, so I had to rebook my flights. All the passengers deplaned after that, either going in line to rebook or waiting for the delayed flight. When I got into the terminal, a giant line formed at the counter for the gate, but I remembered that I had the Delta app, so I chose to rebook from there. 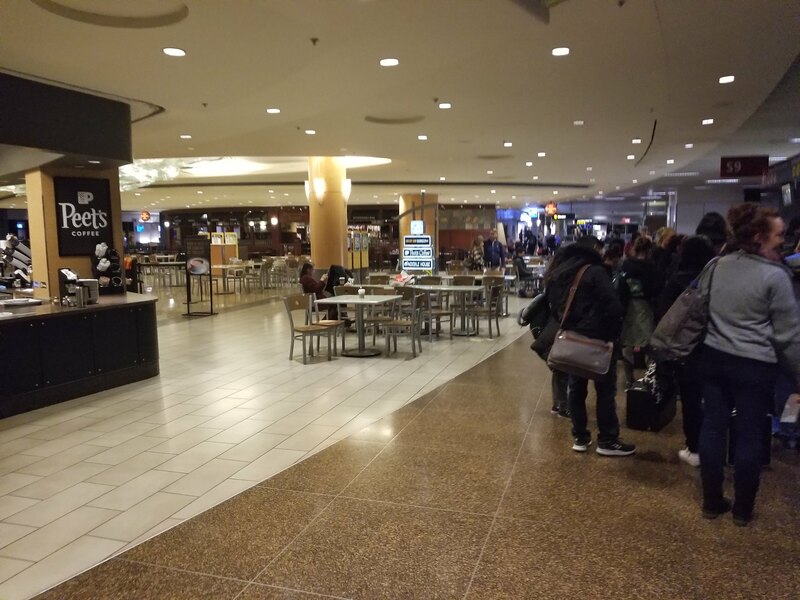 Since I had school the next day, I was primarily searching for flights that got into Seattle as early as possible. 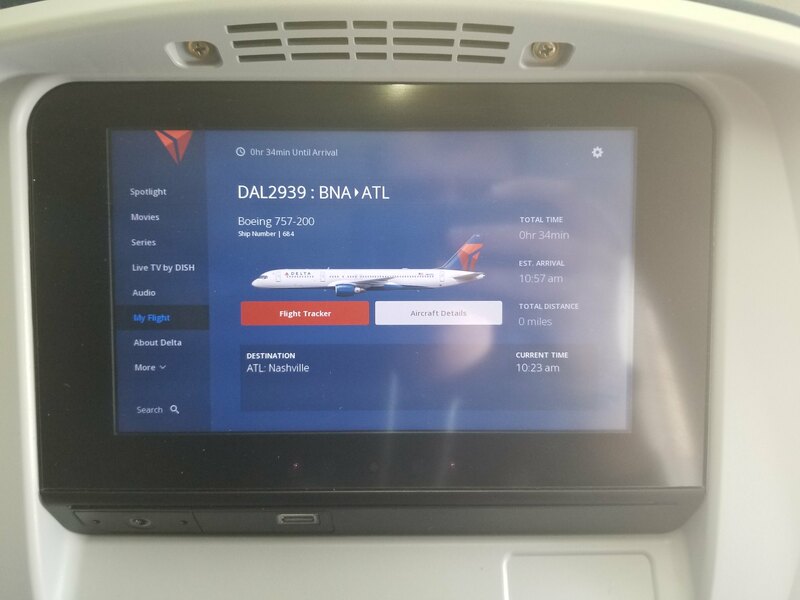 At first, I was looking at a double connection over Atlanta and Indianapolis, getting into Seattle at 7:30, but when I tried to select it, it was already fully booked. 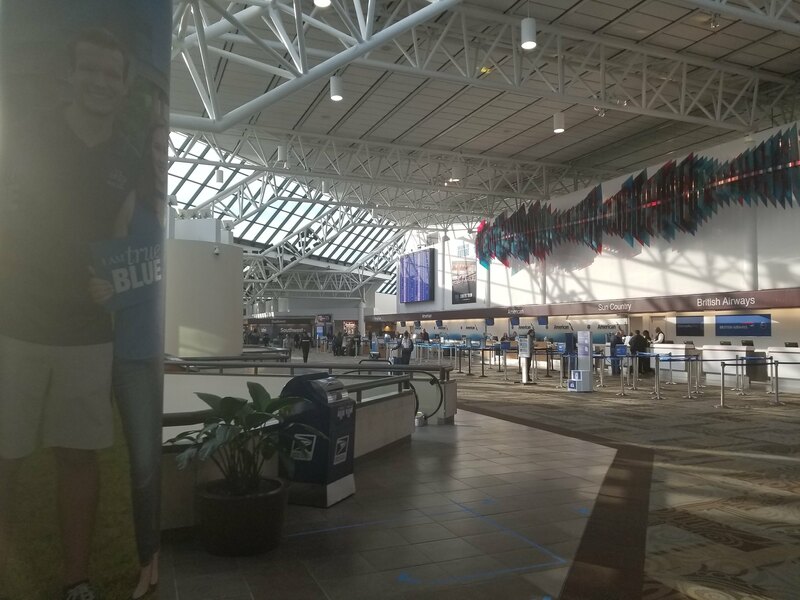 I then settled on an itinerary connecting via Minneapolis. 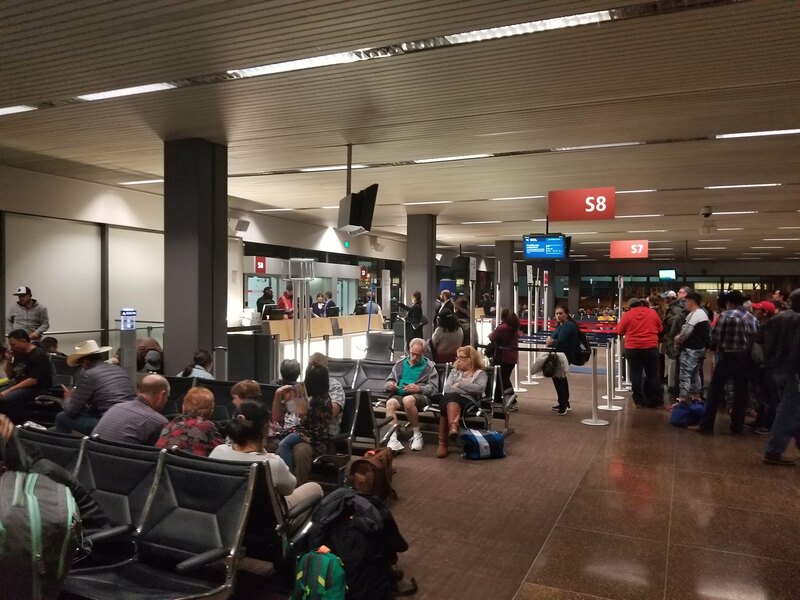 While I was lucky to even get seats on these flights, I had to wait for 6 hours in the airport, which got boring quickly. After I informed family at home about my flight changes, I went to a gate to get my boarding passes printed out. Amazingly, even though my BNA-MSP segment was a completely full flight, I got seat 10D, a window seat in the very first row of economy. 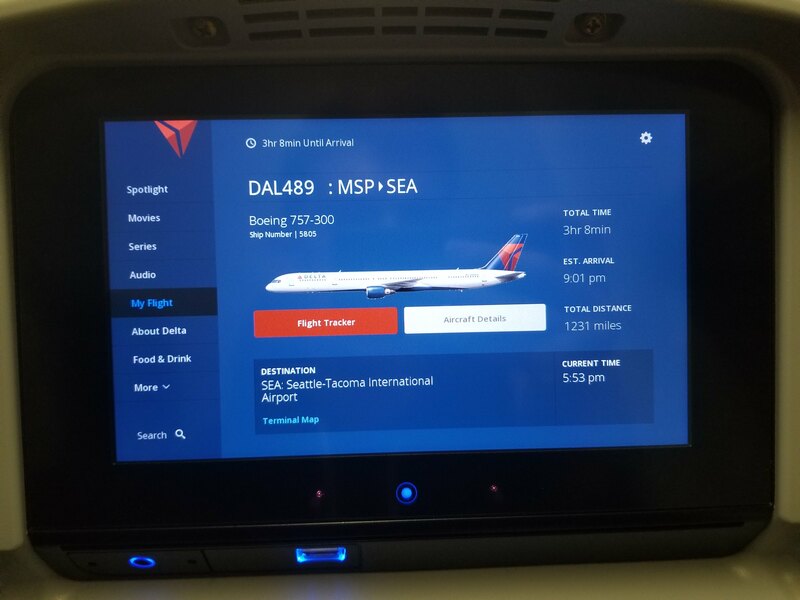 For MSP-SEA, I was to get my seat assignment at the gate in Minneapolis. During my wait I alternated between doing schoolwork, walking around the airport, and doing more plane-spotting. American Eagle E-145 to LaGuardia. 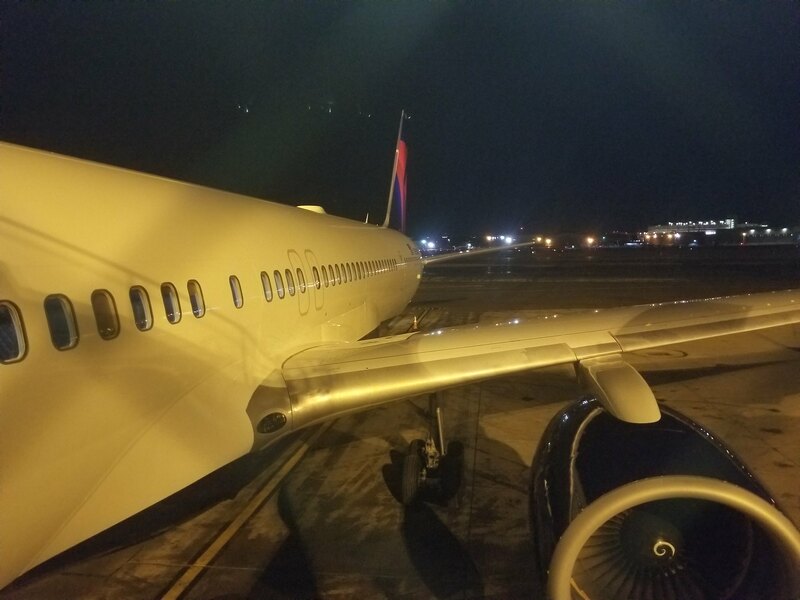 The 757 that I was supposed to take to Atlanta, getting some maintenance work done on it. 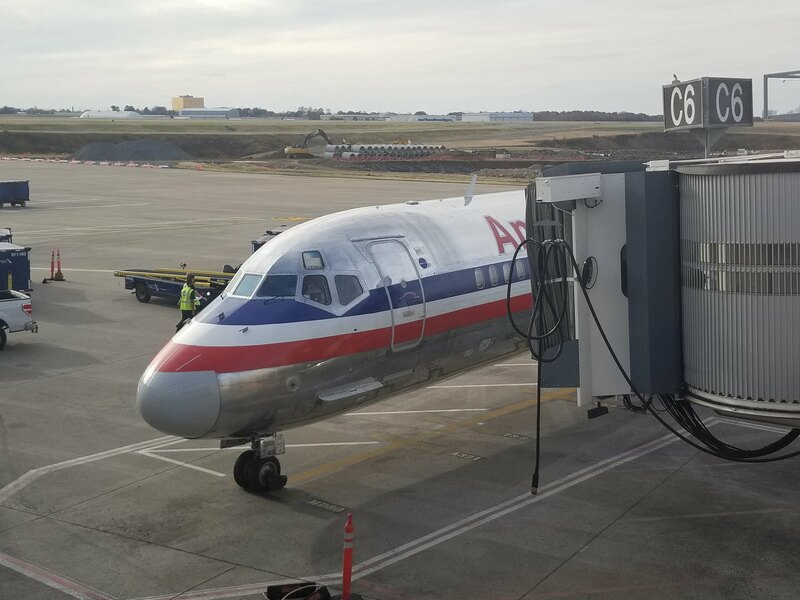 American MD-80 pulling into the gate arriving from Dallas/Fort Worth. 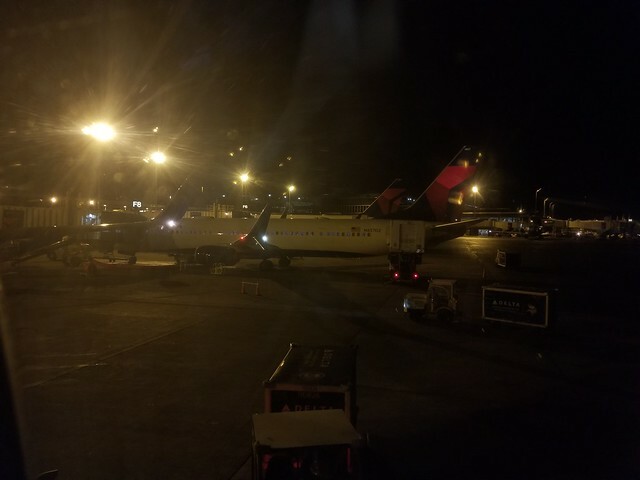 Delta E-175 at the gate next to my Minneapolis flight arriving from LaGuardia. 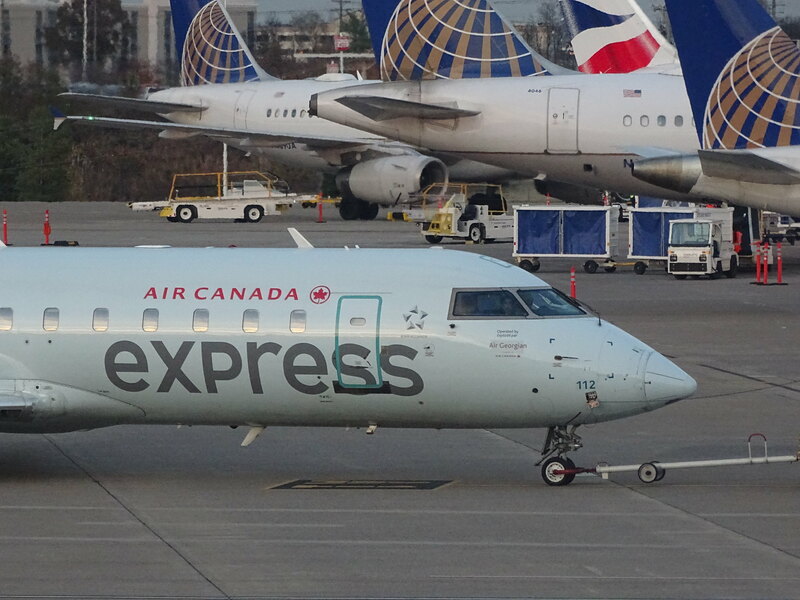 Air Canada Express CRJ-200 being pushed back for a flight to Toronto. I'll just skip over the boring waiting part and get straight to the flight from here. 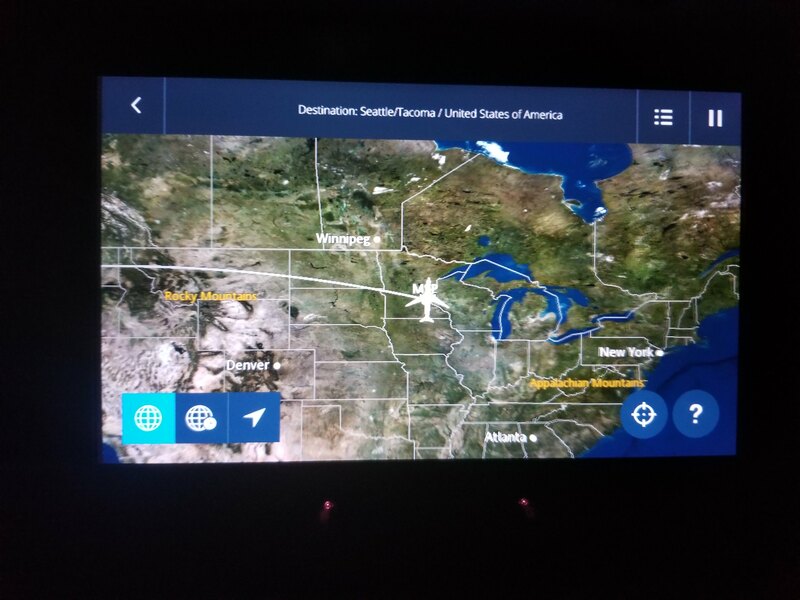 My plane left Minneapolis about an hour late on its inbound flight, so a 20 minute delay was posted, but I wasn't too terribly concerned since airlines pad their flight times anyways. At about 4:15 pm, my plane arrived at the gate. N264SY, a 0.7 year old Embraer 175 operated by Skywest Airlines. 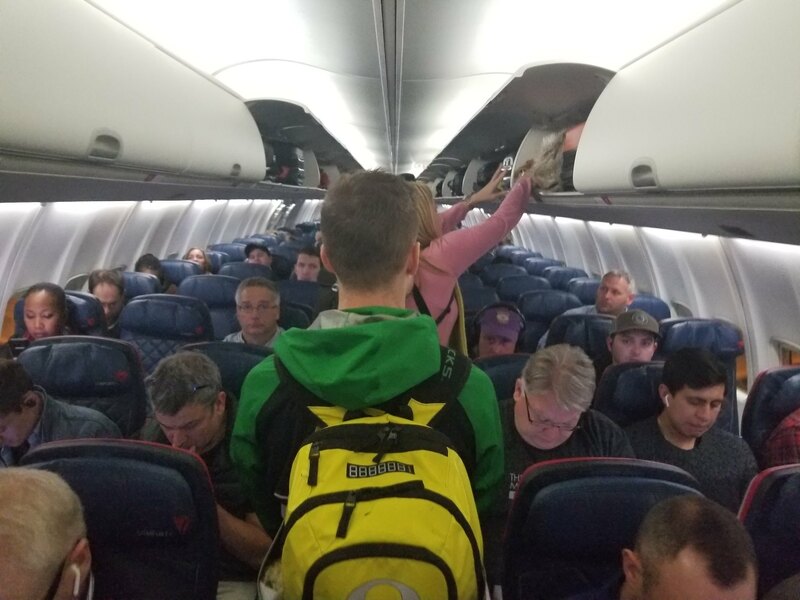 They turned around the airplane rather quickly, and announced that everyone's tighter connections in Minneapolis should be fine. Boarding was announced shortly thereafter, at around 4:35. A closer view of the plane. 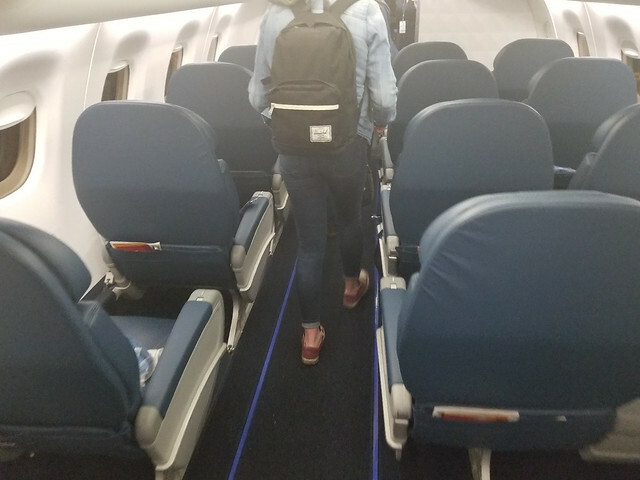 There was a bit of a holdup in the aisle thanks to the person in front of me taking 5 minutes to store a bag in the overhead that was too big, but other than that boarding was quick. 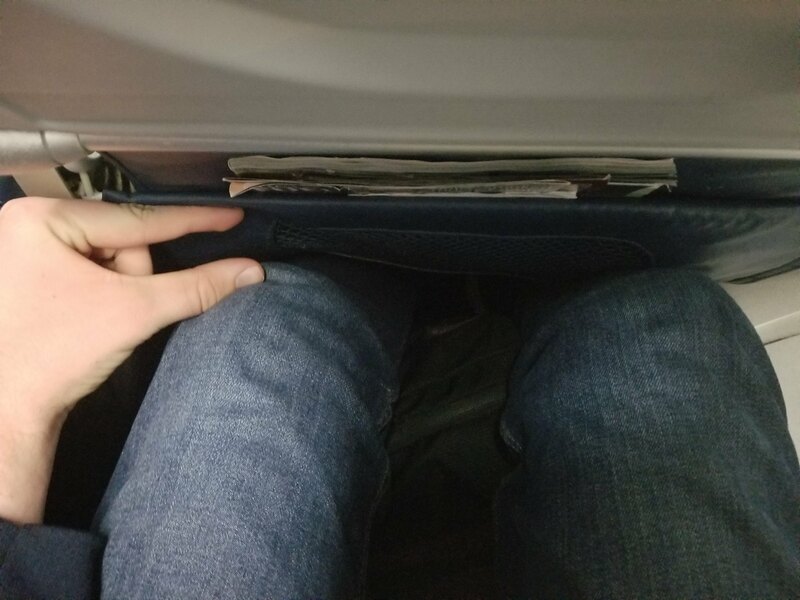 I took my seat in row 10, over the wing. 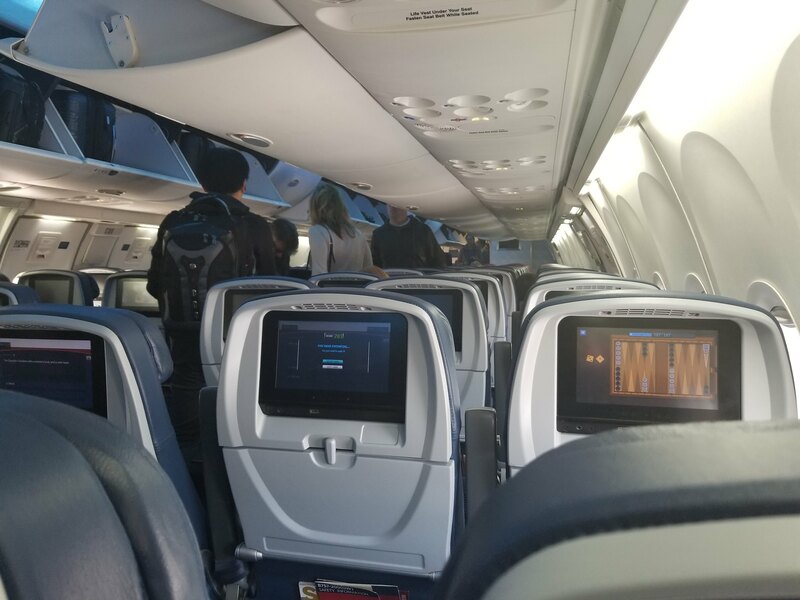 This was my first time flying on an E-Jet, and I was very impressed with it. 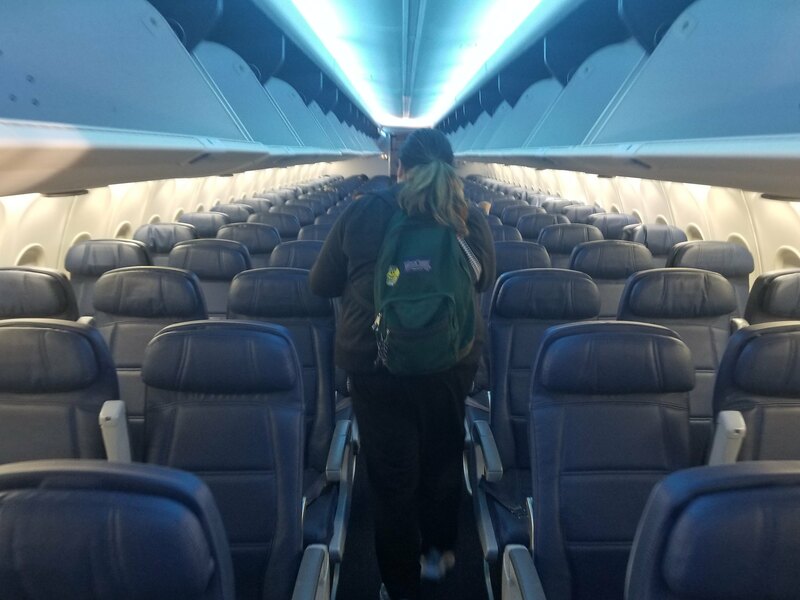 The seats were comfortable and wide, the windows were huge although they were slightly misaligned, and the overhead bins were decently-sized for a regional jet. 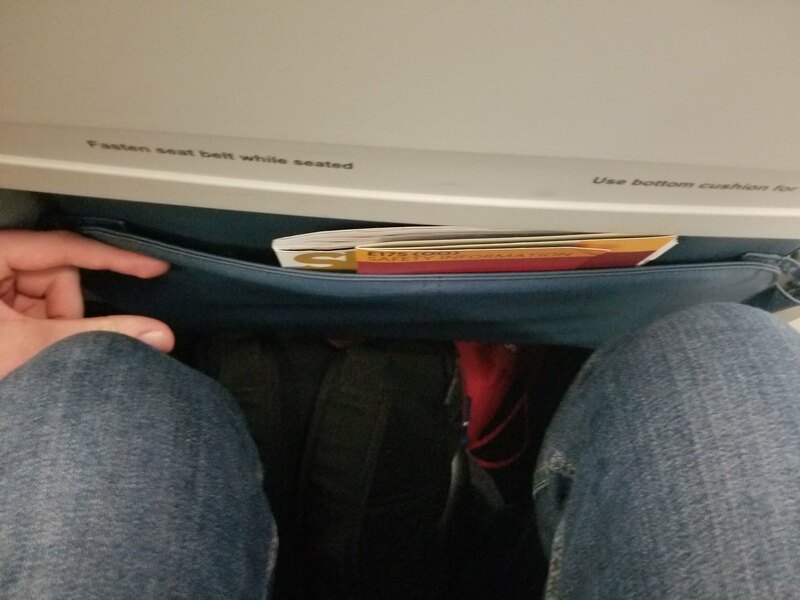 The photo doesn't show it well, but legroom was also good, although that may be because the plane is in a special 70-seat configuration due to regional airline scope clauses. My view of the cabin after boarding was finished but before pushback. 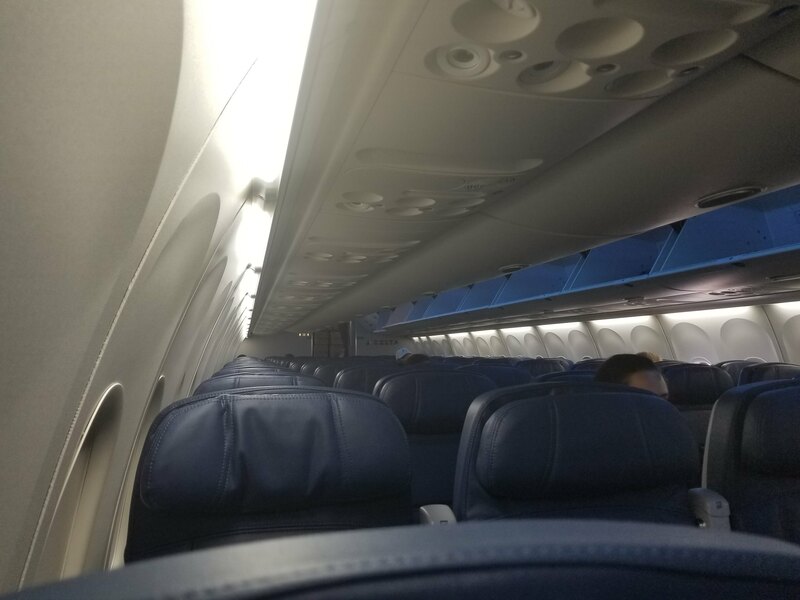 Since this is a new plane, the cabin was basically pristine. After everything was said and done, we pushed back a few minutes before 5 pm. The Chicago-based crew introduced themselves, then did a manual safety demonstration. 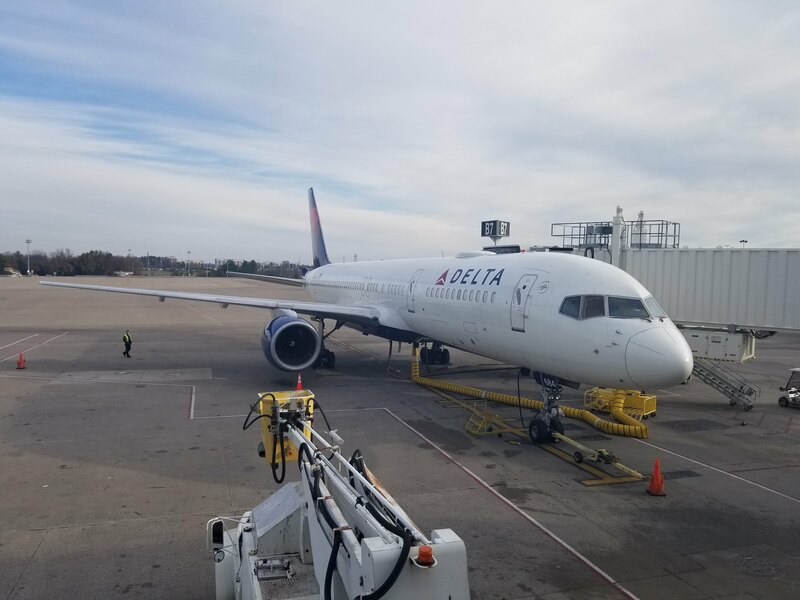 The taxi time was short, and we only had to wait for a Delta 757-200 bound for Atlanta to depart before it was our turn. Here's a video of our departure. It's not the best quality, but hey, it's better than nothing. Our climb was fairly turbulent but quick. Once the streaming IFE was turned on, I started to explore it and was satisfied with what it had. The movie/TV show library looked impressive, although I chose to read a book during the flight instead. There was also a flight tracker, arrivals info, and aircraft data. 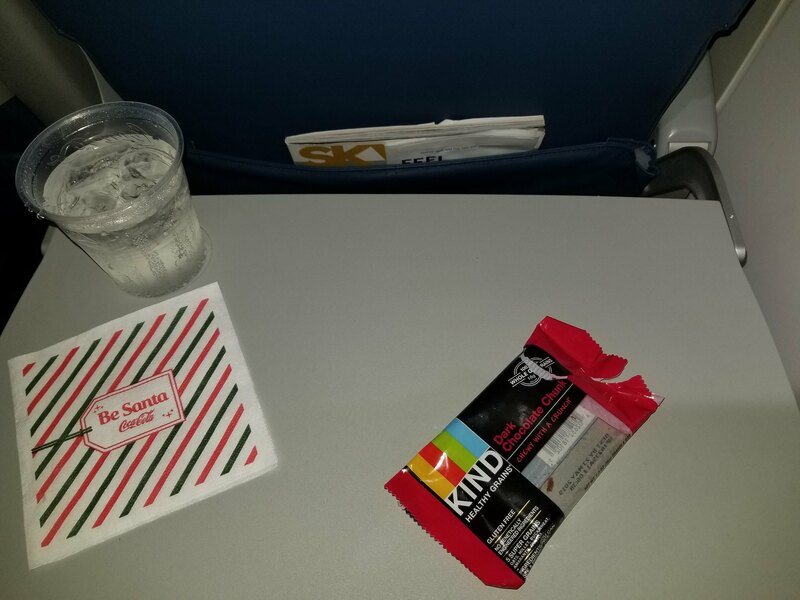 30 minutes or so into the flight, the attendants came through with beverage and snack services. The only snack choice was a KIND bar, and I had a Sprite to drink. The flight attendants were friendly and professional, having brief conversations with passengers as they were serving them. After that, the flight was mostly uneventful, save for some turbulence around Iowa. 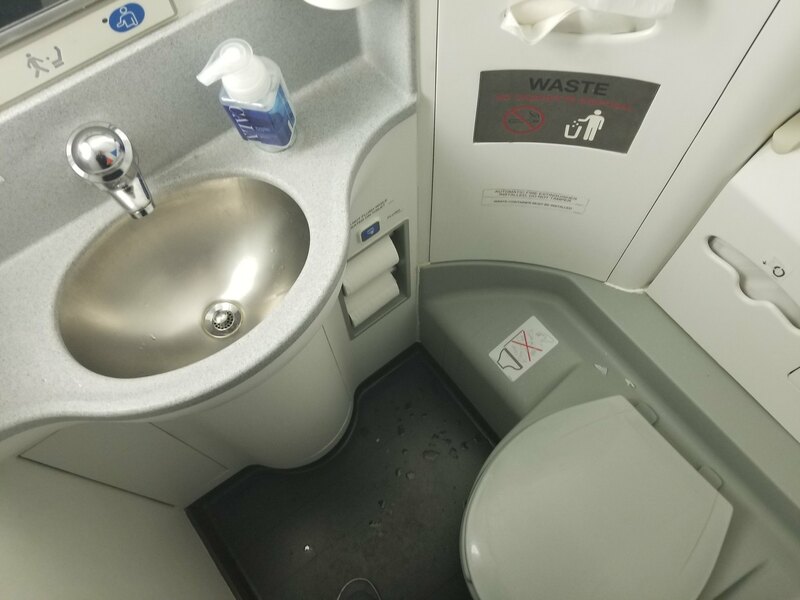 I visited the aft lav before descent, and it was clean and served its purpose. A view of the entire economy cabin. 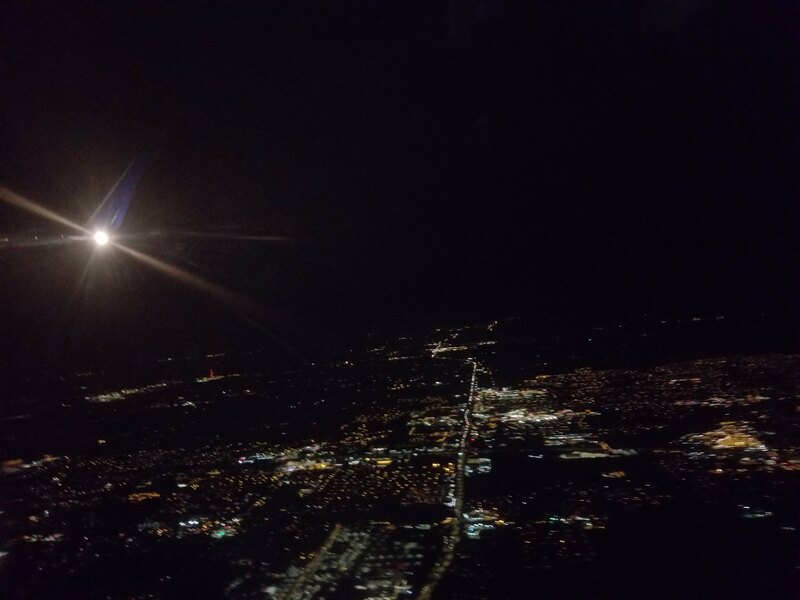 Descent was uneventful too, and we made a smooth touchdown in Minneapolis. Just like with the takeoff, a YouTube video of our landing is below. 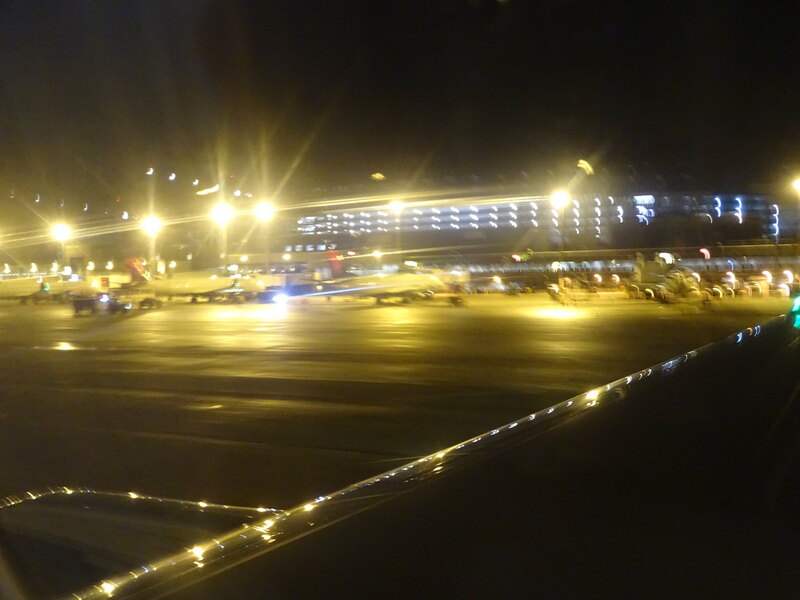 Although it was dark so photography was difficult, we passed a good number of MD-90 and 717 aircraft on our taxi to the gate, which was interesting given how rare they are in other parts of the world. We docked at gate C13 exactly on time at 6:54 pm. 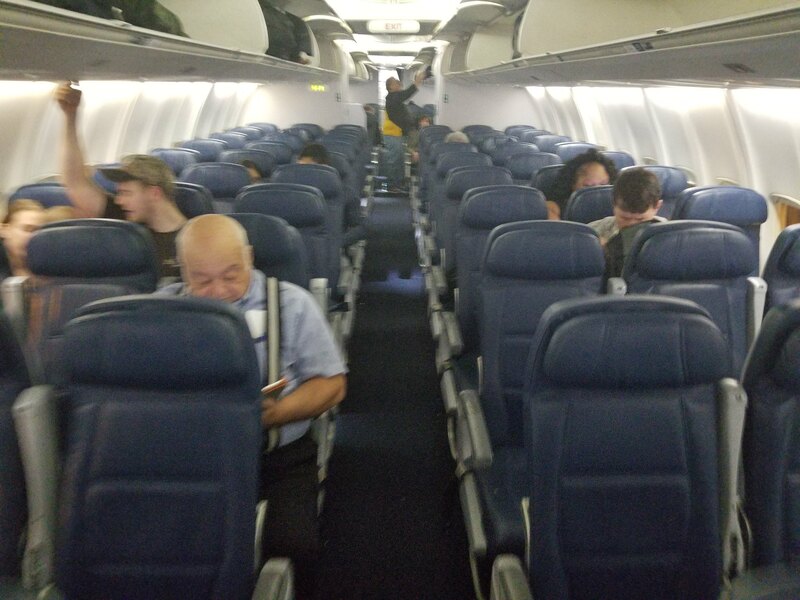 For the sake of completeness, here's a blurry shot of the first class cabin I took while deplaning. Since I had a tight connection in Minneapolis, I didn't get a shot of N264SY at the gate, but it was heading to Chicago O'Hare after this. In the gate area, I met up with my grandparents and started making our way to the gate for our next flight at gate F10, which was quite a walk. 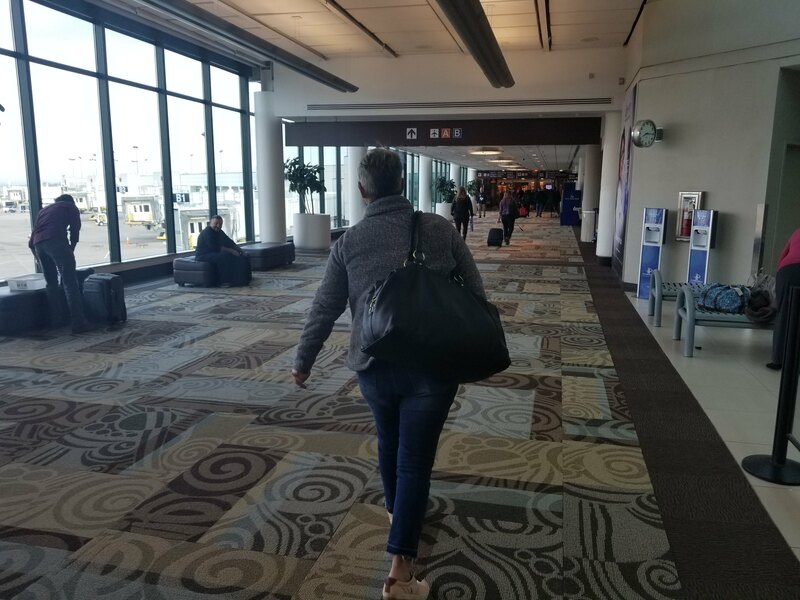 If you don't happen to know MSP airport very well, just know that it's quite a walk, being about halfway across the airport. I'd heard that MSP has courtesy golf carts, but I hadn't found any, so I started walking. 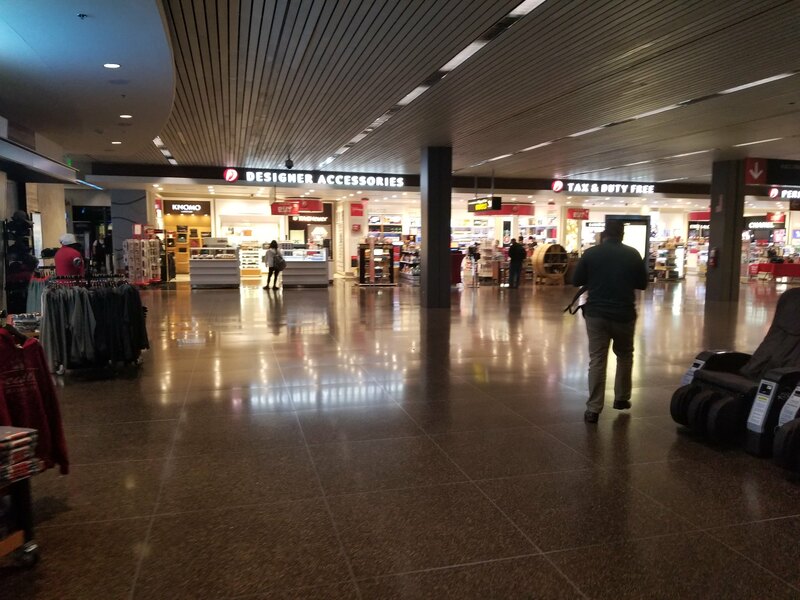 Because I was in a hurry, this was the only photo I got of MSP's terminal. It's aesthetically nice and spacious, with lots of amenities, but it has a confusing layout that isn't ideal for tight connections. 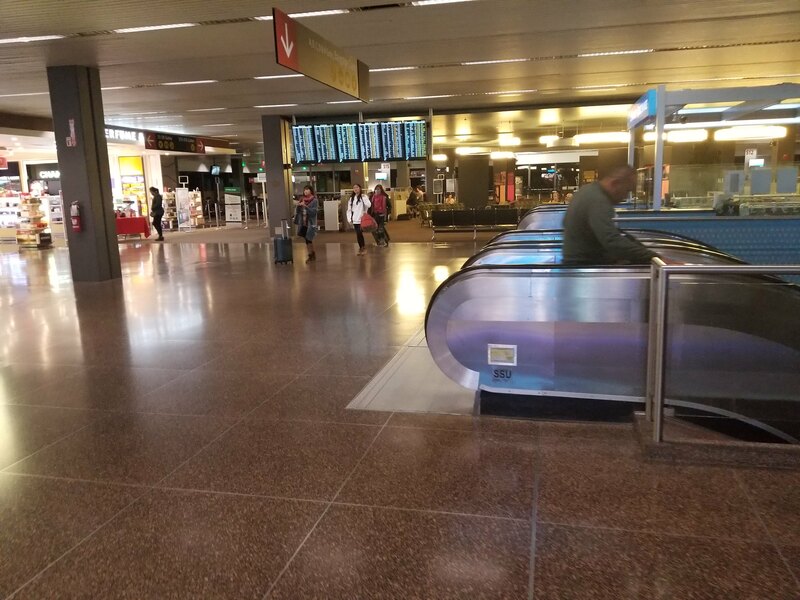 They had a tram, which I rode to the end of its line at the D gates, then we walked over to our gate at the end of concourse F, where they were pre-boarding. My grandparents stopped at the restroom, while I went to the gate agent to get our seat assignments, because they hadn't been assigned due to earlier events. Lo and behold, we got seats in the last row. 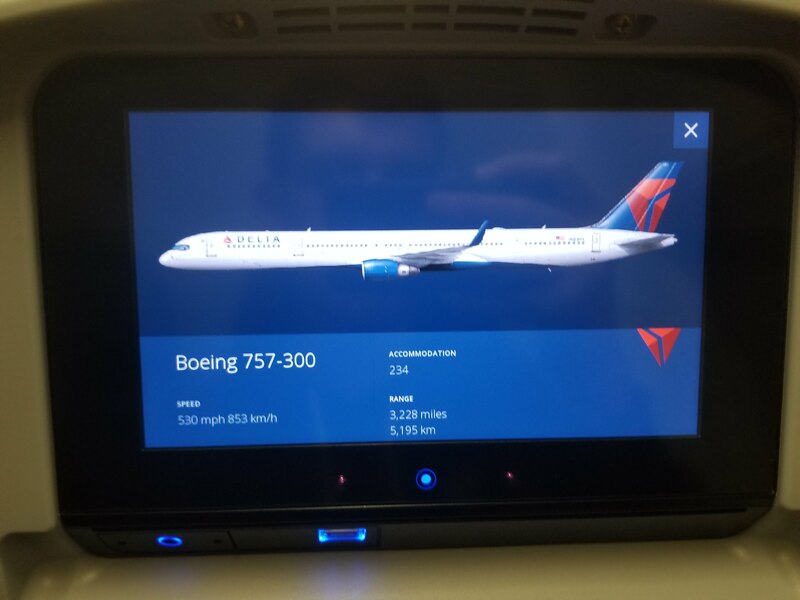 On a completely full 757-300. *wince* Don't get me wrong, I'm glad that I got on the flight in the first place, but I was grateful that I wasn't making another tight connection in Seattle that evening, because I wouldn't have made it. Like before, we boarded in zone 1, right before general boarding. 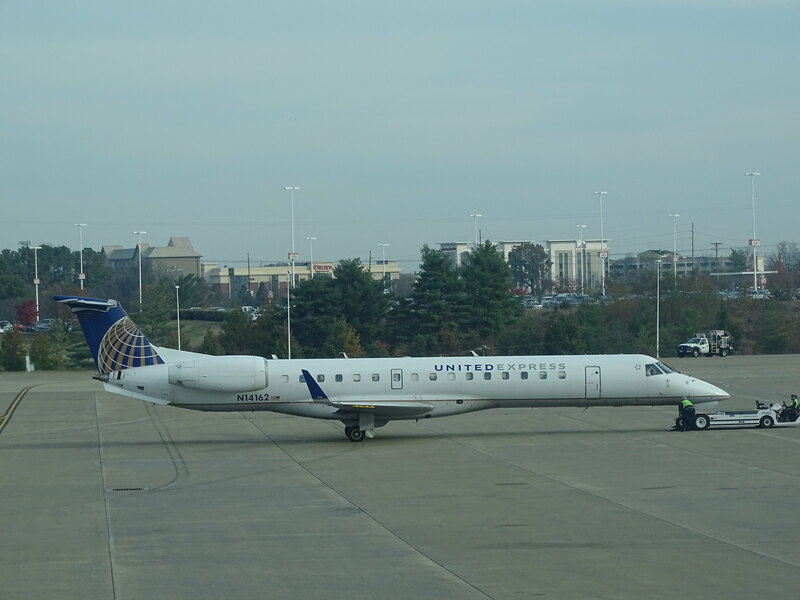 I hadn't gotten a chance to photograph the aircraft from the terminal, but I got a shot of it from the jetway. 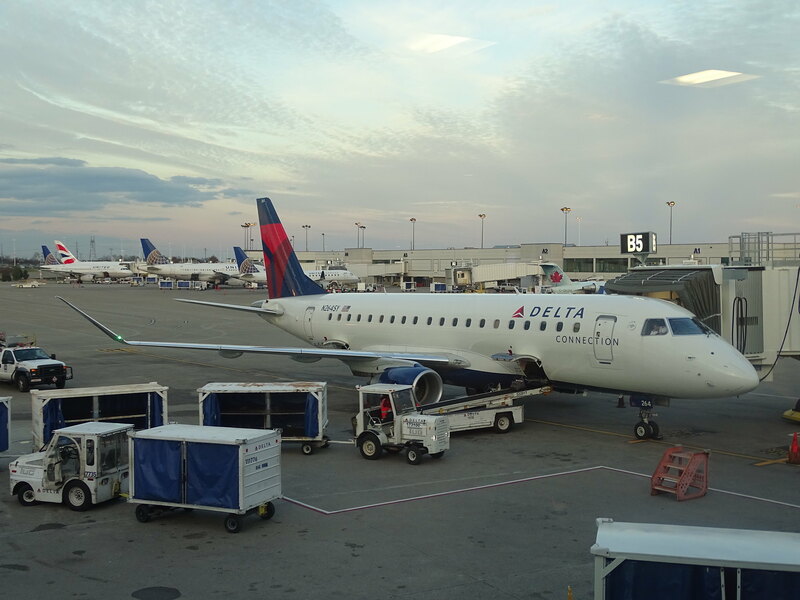 The aircraft I was flying on was N585NW, and it is 16.1 years old, spending the first 7 years of its life with Northwest Airlines before being transferred to Delta in 2009. Boarding was through door L2, as is the norm with Boeing 757 aircraft. There was a monitor showing the time to departure in the jetway, which I found interesting. Yup, it's a long walk to the back. Looking forward from where I was seated. The cabin was decent on this 757-300, being similar to my 757-200 to Atlanta earlier that day. 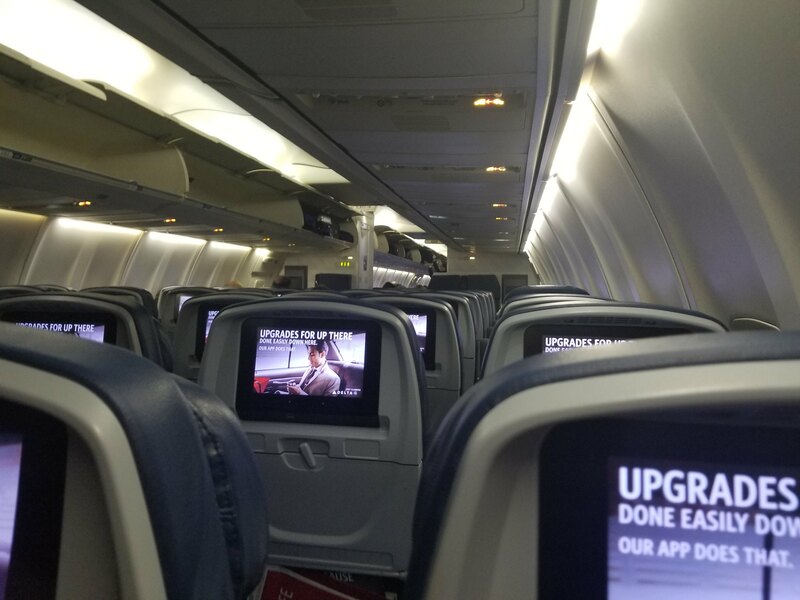 The only differences were the normal overhead bins, and the bins above my row being occupied with emergency equipment, but I didn't have any large carry-ons so it wasn't a major issue. 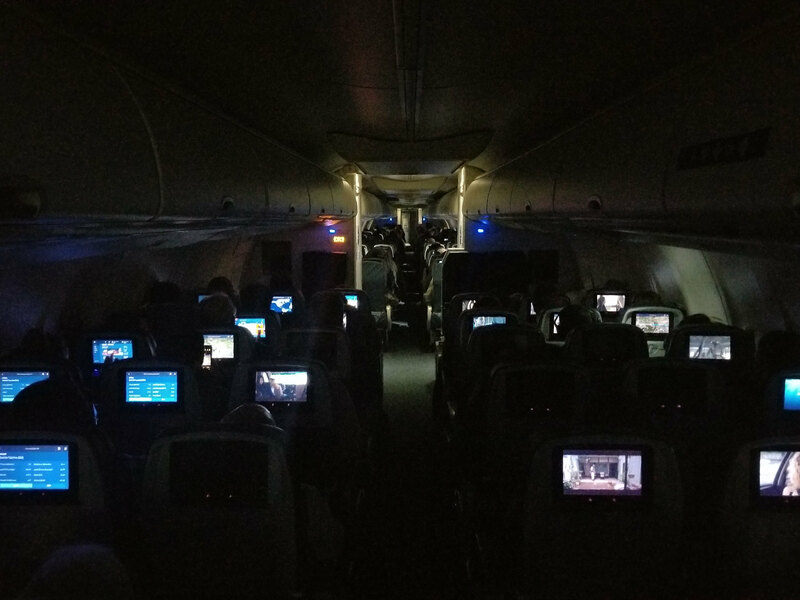 The IFE was identical, except for the lack of live TV. My row couldn't recline, but that was okay since the legroom wasn't terrible. 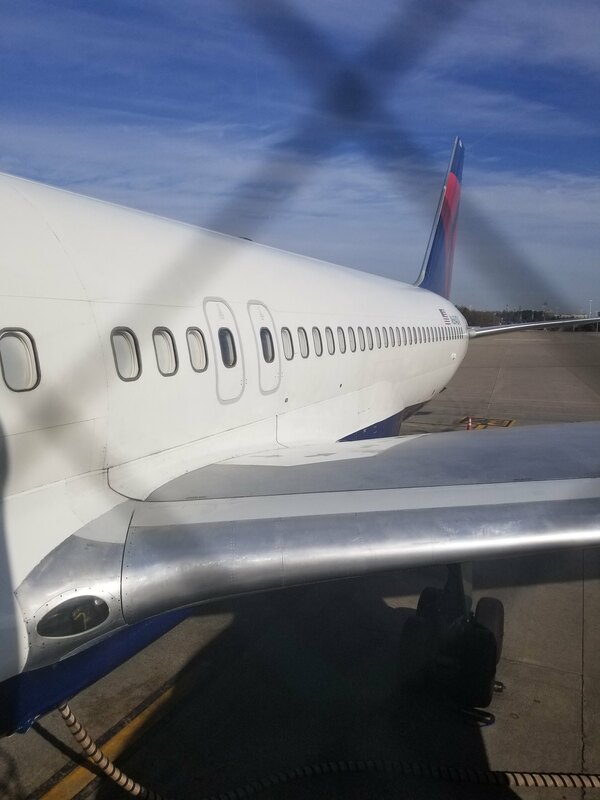 One way that Delta could improve was on their aircraft cleaning, since there was some wrappers in the seat pocket, an unopened pack of headphones on the ground, and a vent panel near the floor that was loose. 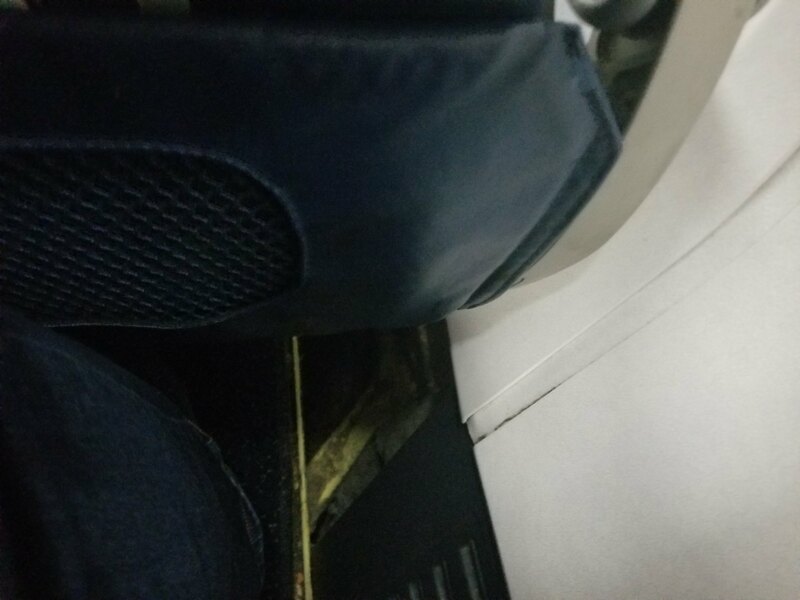 This was likely an isolated incident though, since all of my other flights on Delta had very clean cabins. There wasn't much of a wing view, being so far back in the airplane. 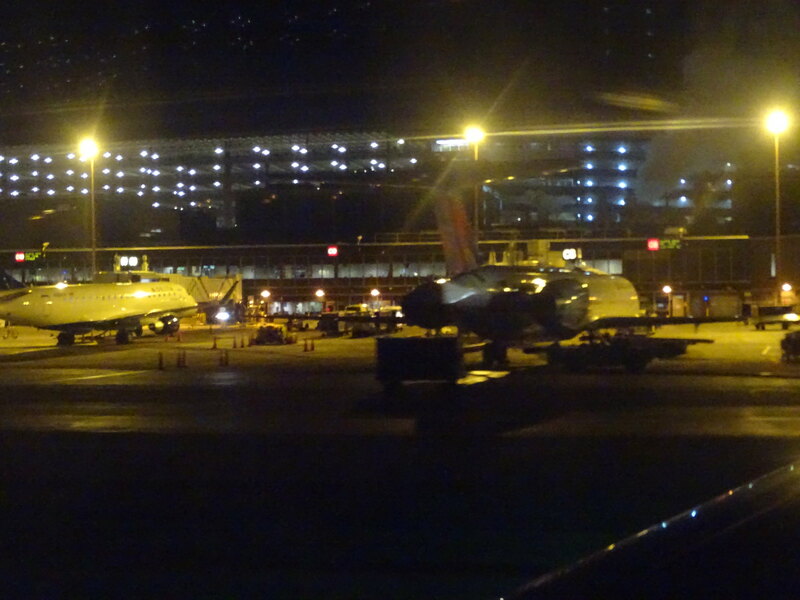 Boarding took a while, for obvious reasons, so pushback was 22 minutes late, at 8:12 pm Central time. 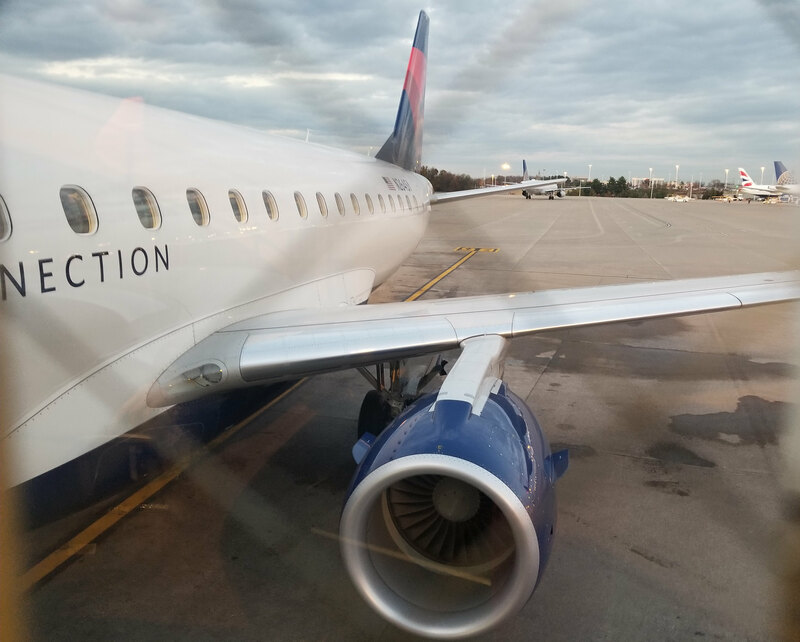 I noticed an unusual characteristic of the 757-300 while we were taxiing-since we were sitting so far back in the airplane and the gear was so far forward, it felt like we were being "swung" or there was a pulling effect, for lack of a better description, whenever we turned a corner. There was no wait for takeoff, and a few minutes later, we shot into the cold (26 F, -3 C) night sky above Minneapolis, due west. 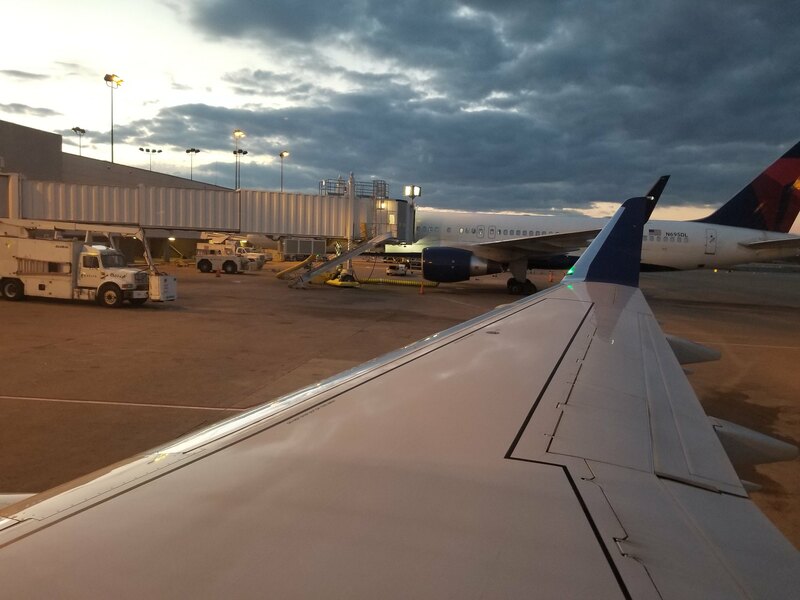 As with my BNA-MSP flight, I have a YouTube video of it. Another unique 757-300 characteristic that I noticed while sitting in the back was that during rotation, it feels dangerously close to a tail-strike, again since the landing gear is so far forward. The initial takeoff felt relatively steep, but the climb after that felt only a little bit quicker than normal. Of course, I've never flown on any other 757, so I have nothing else to compare it to. Wing view while climbing out. Once we got up to cruising altitude, cabin service began. Annoyingly, they only had one cart for what seemed like (and might even have been) the entire coach cabin, so it took a long time to get served. As you can probably tell by now, waiting is a recurring theme of this TR. 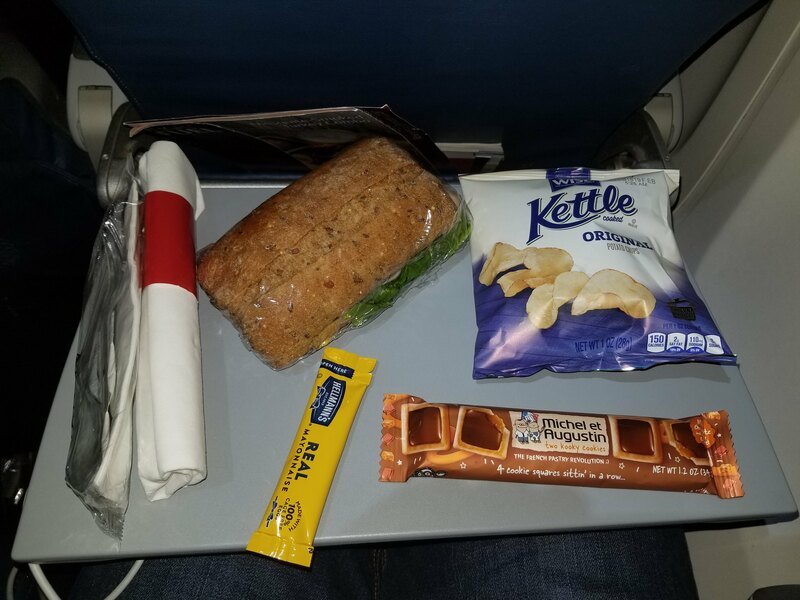 When the cart finally came to my row, I took my usual, a cran-apple juice, and had a snack mix, which I saved for later. The BOB cart came a few minutes later, and I chose a turkey sandwich, which came with chips and caramel chocolate shortbread cookies. It was about $10, and it was good. My only complaints are that the sandwich was kind of dry and the oil had separated from the mayonnaise so it wasn't usable. I watched a couple of episodes of Modern Family, but otherwise mostly kept the IFE on the flight map/aircraft data. We hit some turbulence over Montana, which was interesting, since I could notice that turbulence was rougher in the back. Once that finished, I decided to get up and walk up and down the aisle of the "flying bowling alley" a few times to stretch my legs. 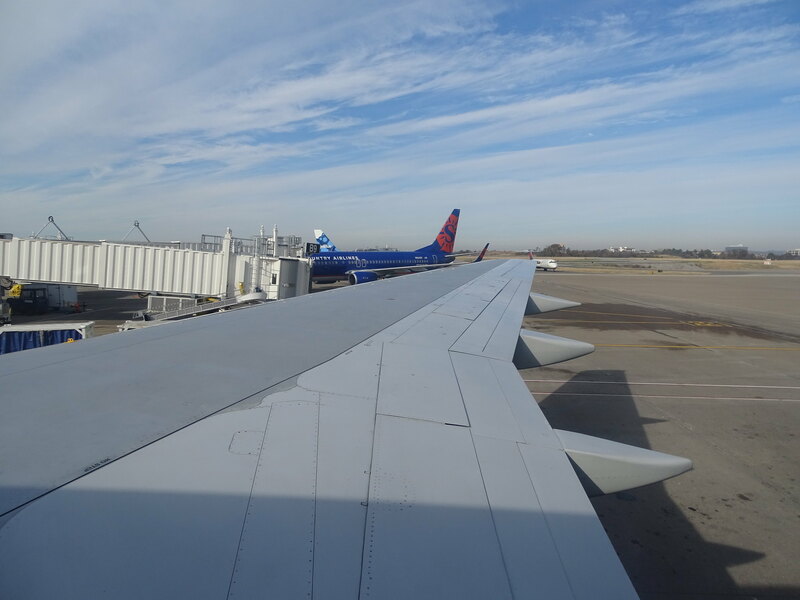 Also, apologies for the lack of wing shots during the flight, the IFE screens caused a lot of glare and there wasn't much to see anyways. Looking up the aisle from the back. 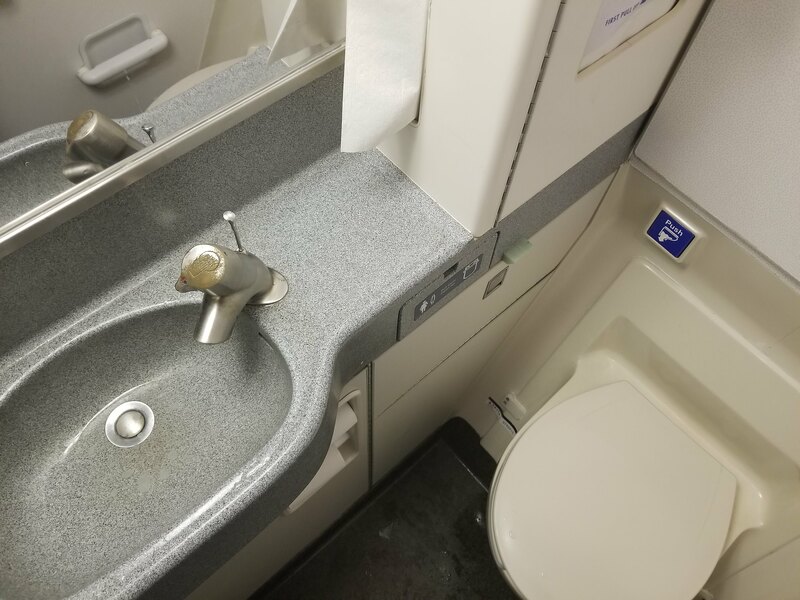 I visited one of the mid-cabin lavatories (there were none behind us which eased the pain of sitting in the back), and it was clean. Descent began a few minutes before 9 pm Pacific time, 3 hours into the flight. 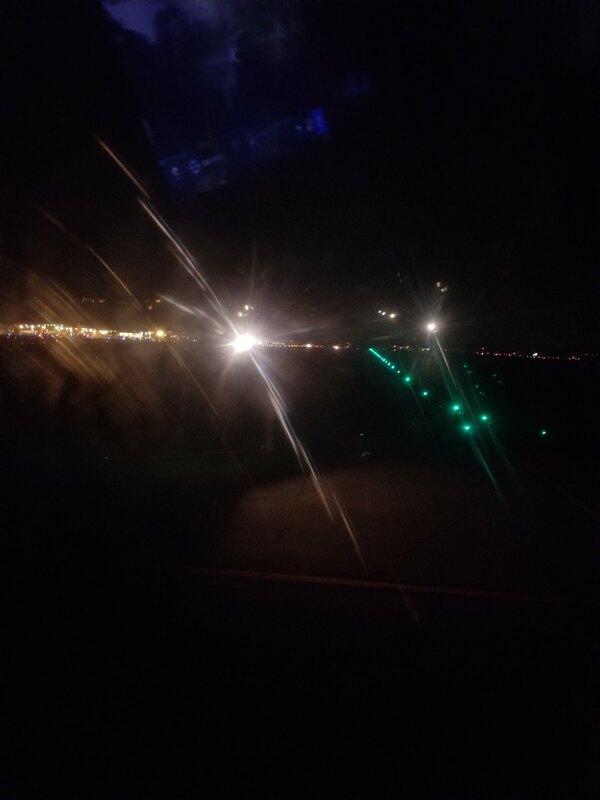 We approached from the south, and had a rough touchdown (likely exacerbated due to the fuselage shaking) on runway 34L at 9:34 pm. 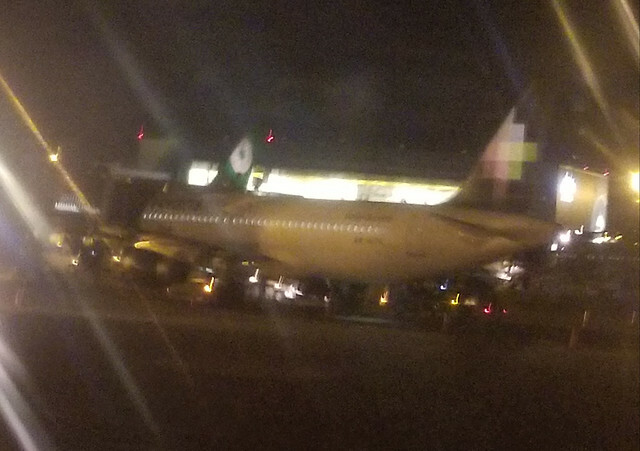 We taxied to our gate, S7, with an Aeromexico 737-800 and a Volaris A320 parked next to us, headed to Mexico City and Guadalajara respectively. After we parked at the gate, it took a good 25 minutes before we deplaned. 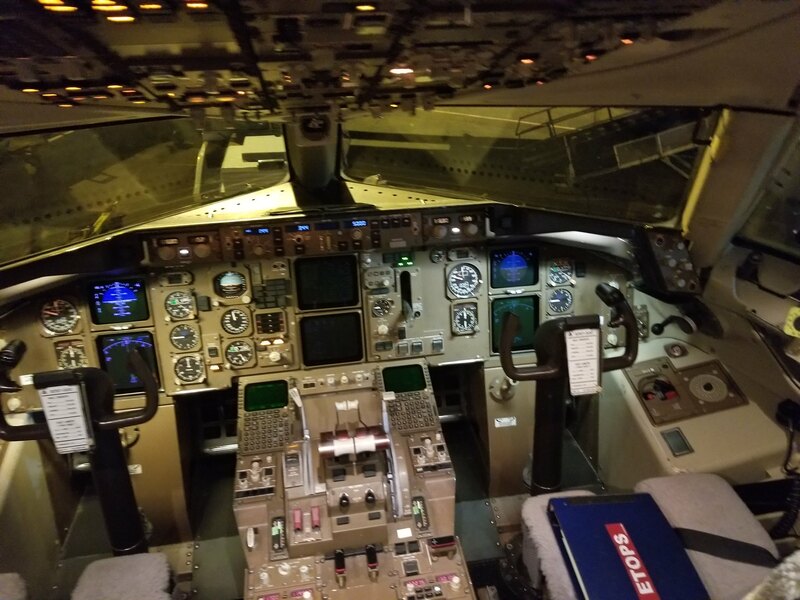 My grandparents went out in the terminal, while I asked to visit the cockpit, and my request was granted. Then I deplaned, and went into the terminal. 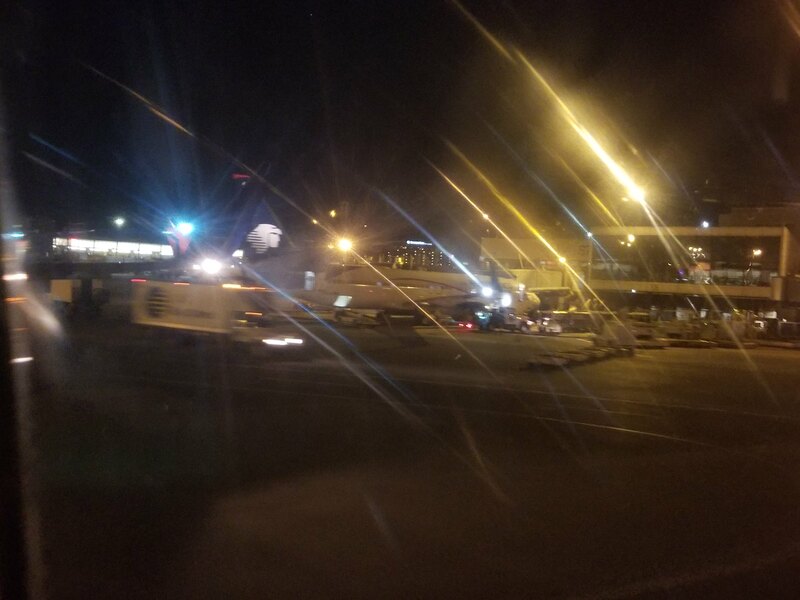 My plane was returning back to Minneapolis shortly after midnight, then was scheduled to fly to Los Angeles and Honolulu the next day. The South Satellite. 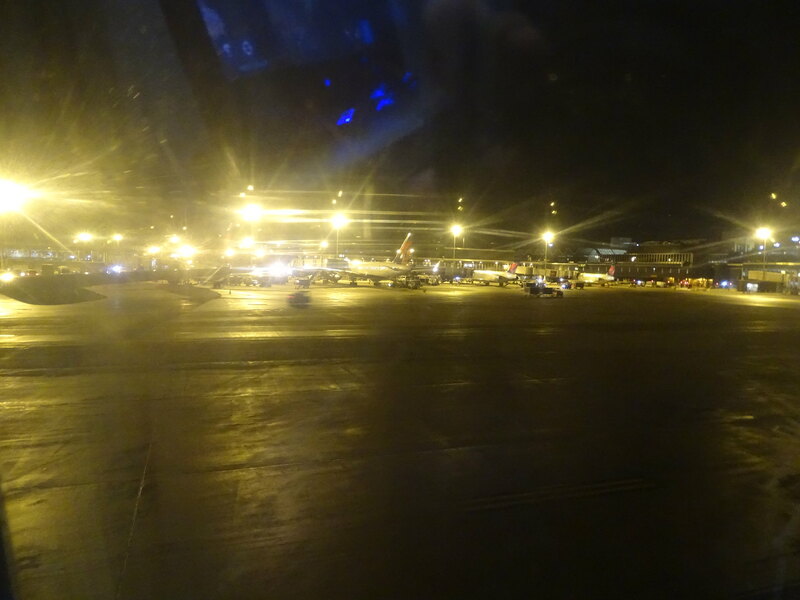 It wasn't terribly busy at this hour, since the only flights were some redeyes preparing to depart. The escalators down to the train station, which takes you to the A and B gates in the main terminal. 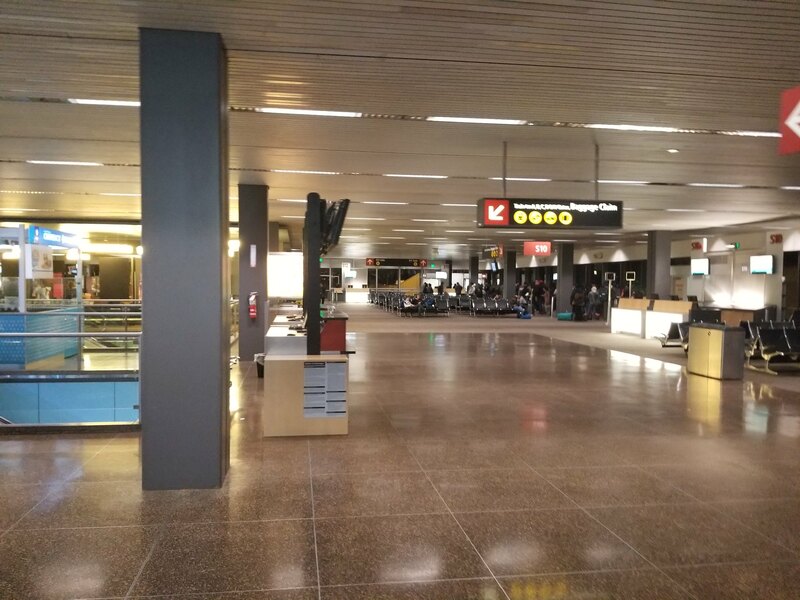 I then went to baggage claim, where my dad was waiting with our bags, which had arrived at about 10 pm. We went to his car in the parking garage, and were out of the airport by 10:30. 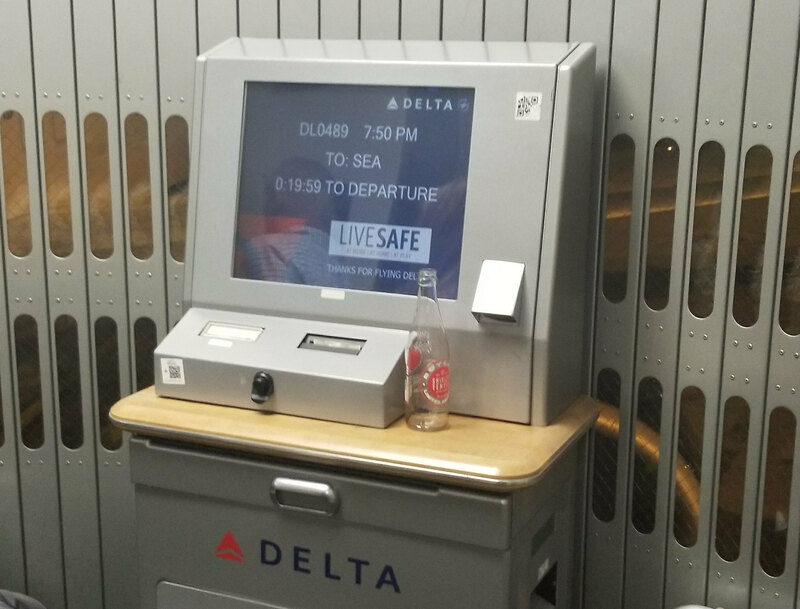 Overall, I was fairly impressed with the way Delta handled this IRROPS situation. I called them a few days after the flight, and they gave us each $100 vouchers too, which felt appropriate. I liked the cabins of each aircraft and service was great. 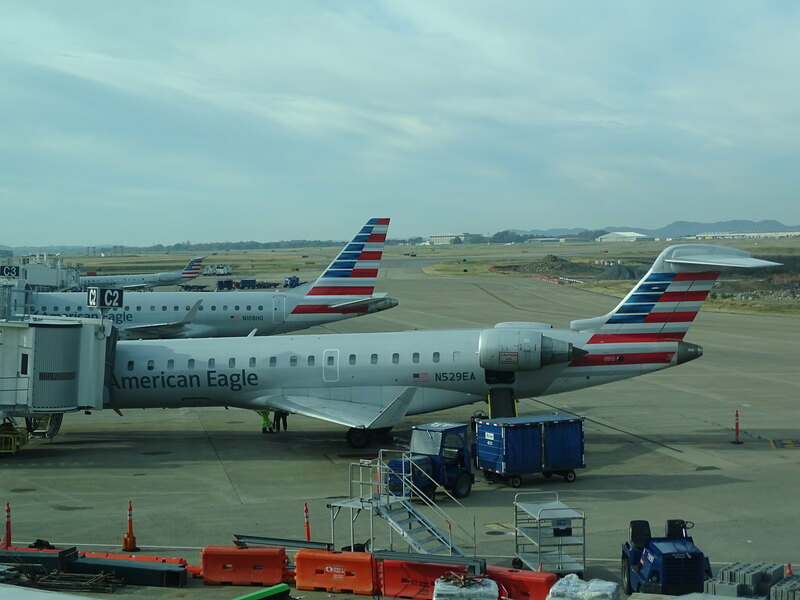 It was disappointing that my BNA-ATL plane broke down, especially since it had spent the night at BNA beforehand, so they had ~12 hours to potentially find any issues, but rebooking was very easy. It was also nice to get my first flights on an E-Jet or 757-300, although it was at the expense of flying on the 757-200 for the first time. 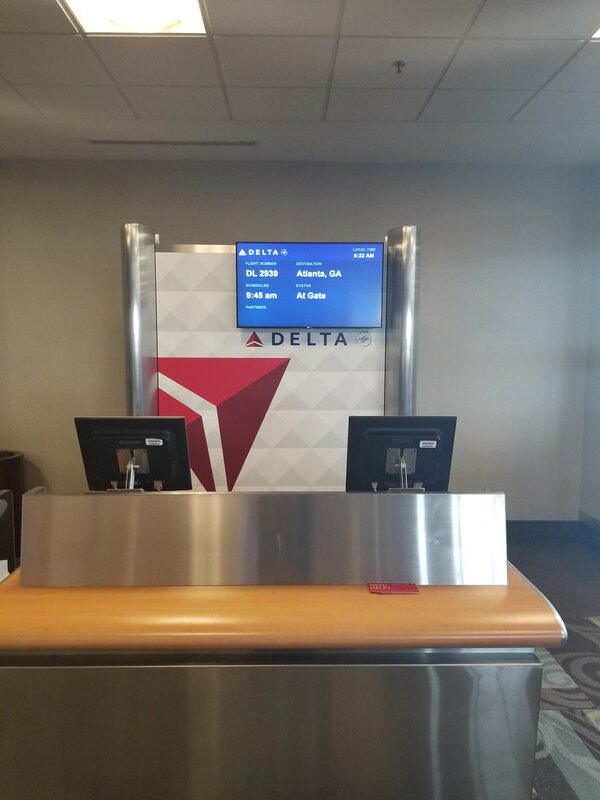 To sum it all up, I was impressed with Delta on this trip and the way they handled their issues, and I would be glad to fly on them again. As always, thank you for reading my trip report! Feel free to give feedback or ask questions. Why blame ATC for the delay? Is that what the airline told passengers? I only ask because many airlines blame ATC for delays when they don't want to disclose the real reason like it being the airline's fault. My SEA-BNA a/c was coming from LAX, so it's understandable that they would be delayed there, although I suppose it could have been something else too. Originally the flight was delayed 30 minutes. Boarding took about 15 minutes, then we waited in line for takeoff for 45 minutes since they were down to one runway each for departures/arrivals at the time due to construction, so it ended up being an hour and a half of delays in total. To answer your question, a good chunk of the delay was actually ATC-related, but it's not implausible that some part of it was the airline's fault, and if it was, it only was an insignificant portion of it. That sounds normal. I don't blame you for the reason blaming ATC. I'm an air traffic controller and numerous times I've been delayed and the airline blames ATC when it was something like weather or construction which is outside of ATC control, so it's kind of a pet-peeve of mine when airlines make ATC the scapegoat for delays. Construction at SEA limits what ATC can do, but I feel the airline should blame the airport operator, but maybe that's too in-depth for the average flyer to comprehend. I enjoyed your trip report. Great job! Makes sense, I completely understand. Thank you, I'm glad you liked it! Good stuff - Nice report. I'm pretty sure I was on N684DA a couple of years ago going FLL to ATL. Nice report! 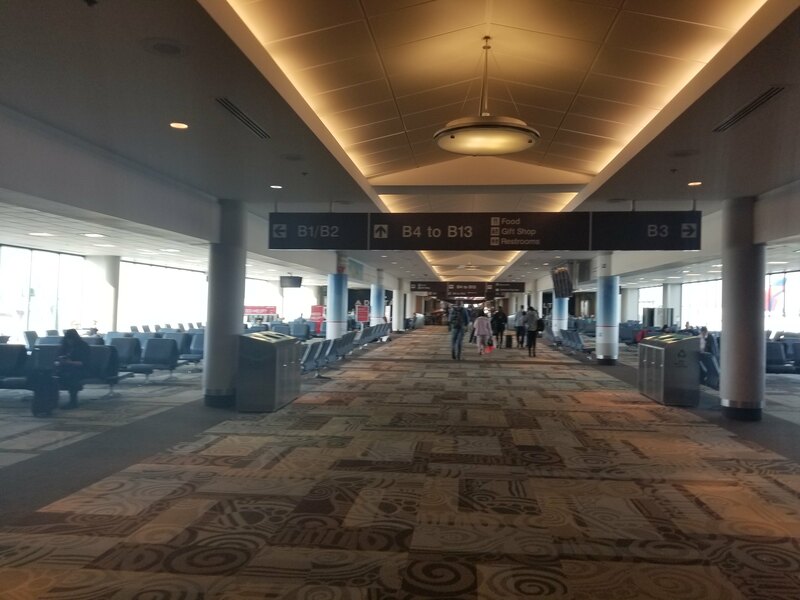 I LOVE BNA! 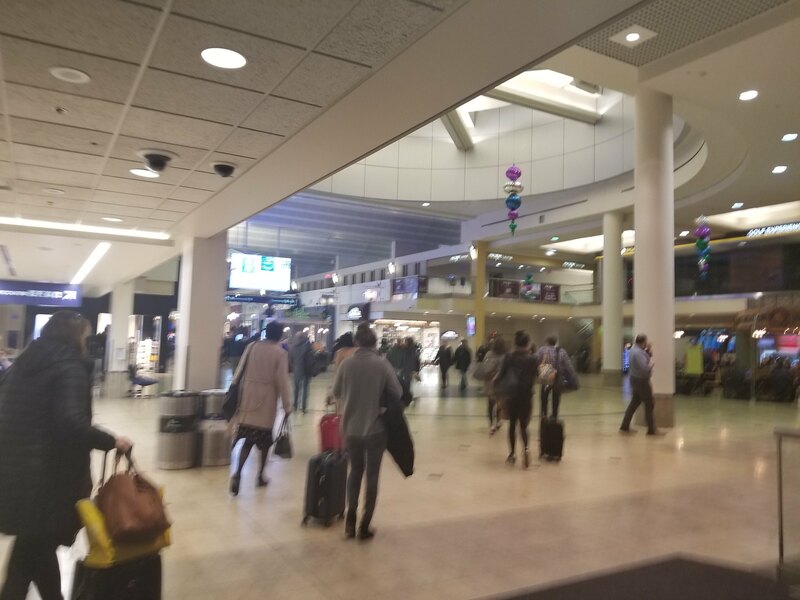 It's such a nice airport and I'm so mad my sister moved away from there! 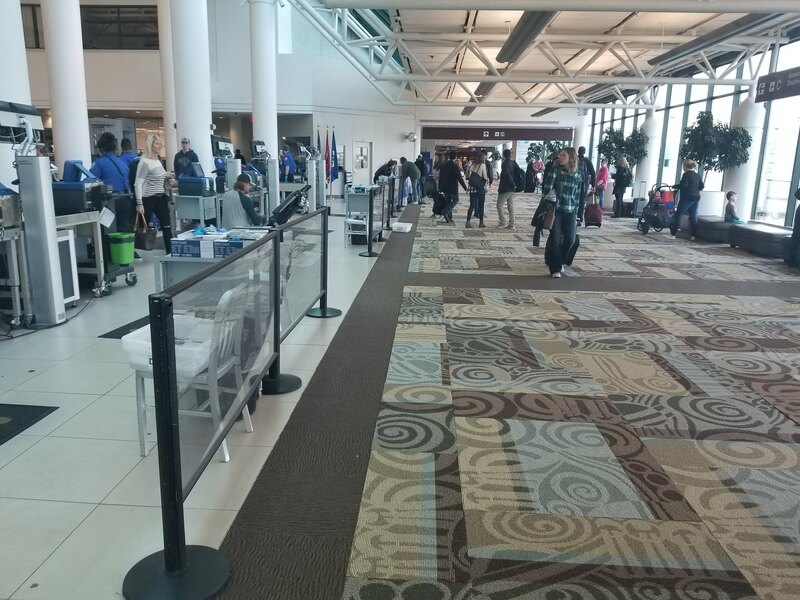 That open check in area with the high ceiling is a really nice touch.